January in Paris; the end of the year celebrations are now behind us. We would like to wish a wonderful year to each and everyone of you who have been following and supporting “Love Picnic Paris”. 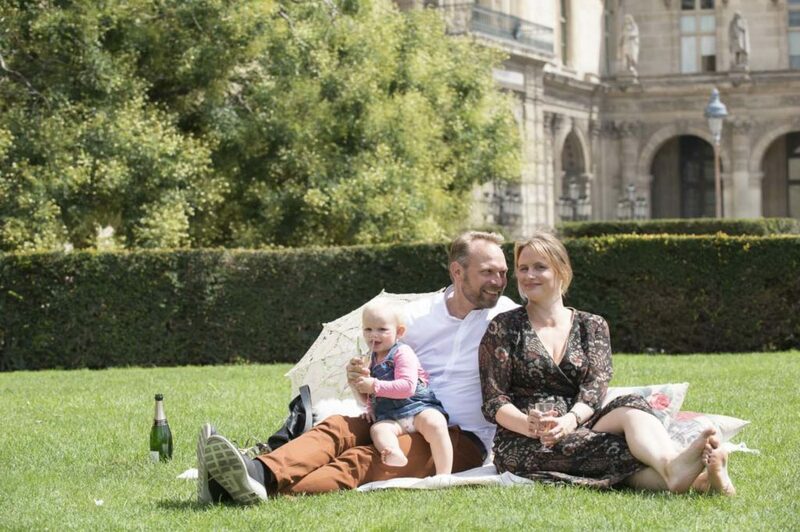 We are very grateful to everyone who have reached out to us for a gourmet picnic and a lifestyle photo session in the city those past couple of years. 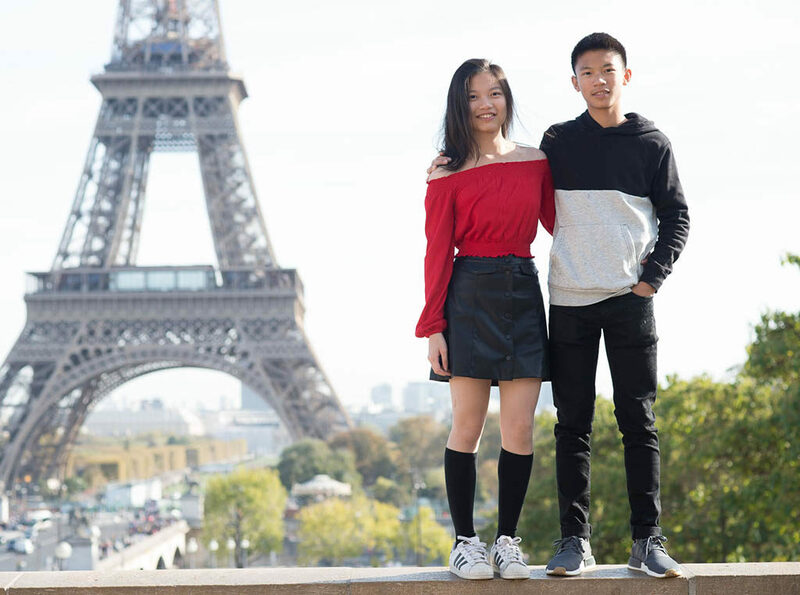 We’ve met many lovely couples and families visiting the city from all over the world. It has been exciting to be able to share our love for the city with so many of you! 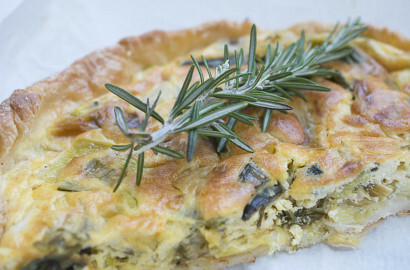 We have prepared many gourmet picnics to cater for friends and families, small and larger groups. 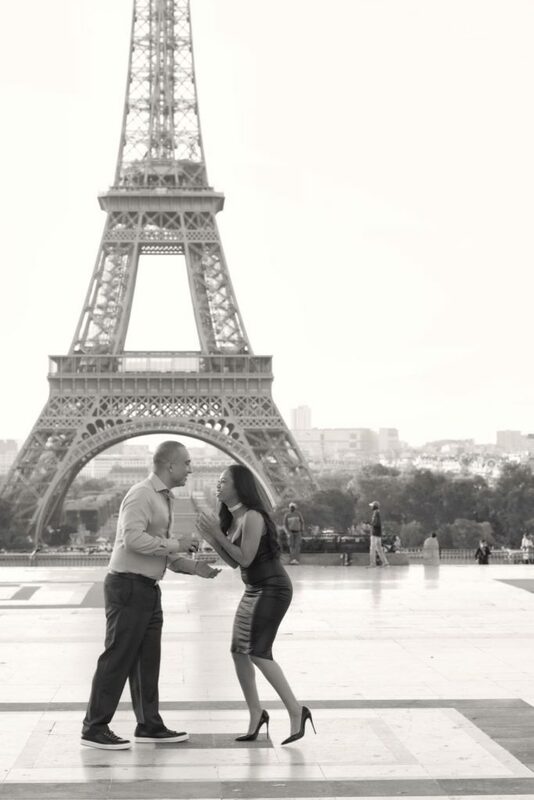 We have planned many secret proposals around Paris this past year as well. 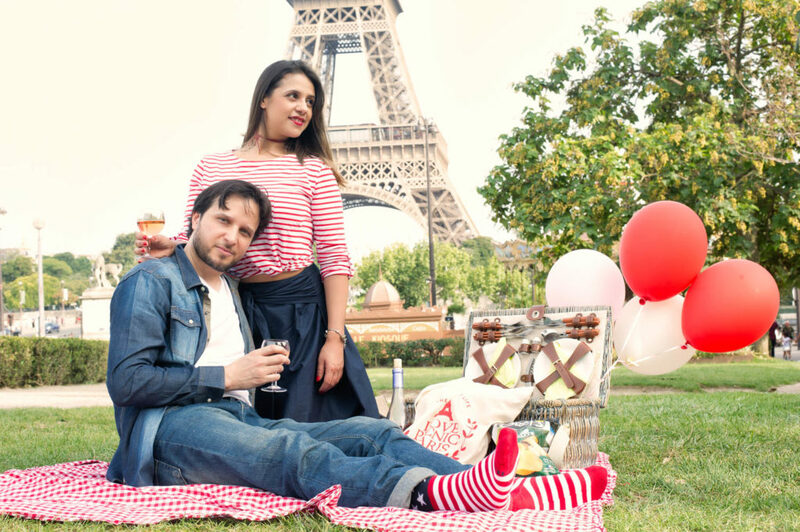 “Love Picnic Paris” is now getting new bookings for the spring season for both gourmet picnics and creative photography with Olivier. We cannot wait to meet all of you in Paris again this year. The weather is incredibly warm for the season at the moment! Not sure it is a good thing by the way, but this is another topic. 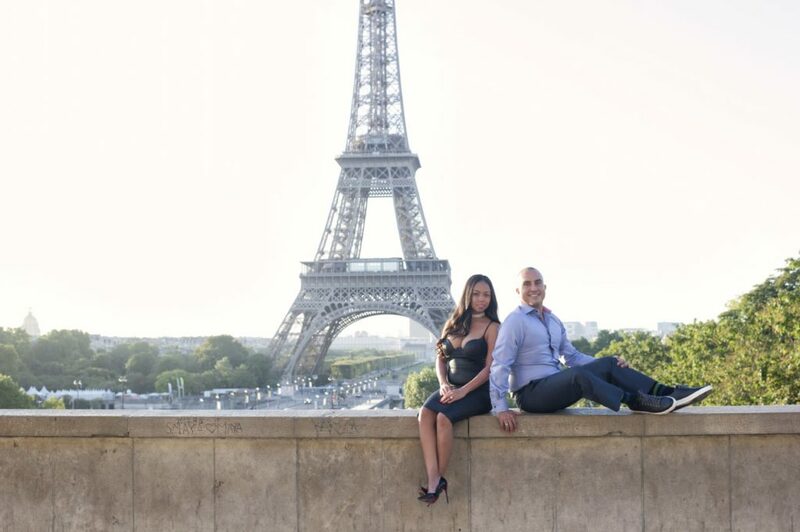 We assisted Joe this past week preparing for his Paris secret proposal at the eiffel tower. 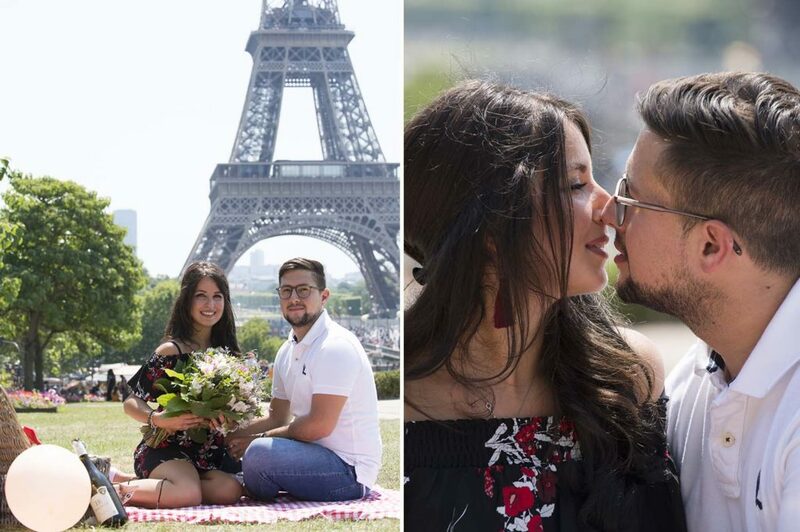 There is no season for LOVE, anything is possible in Paris. 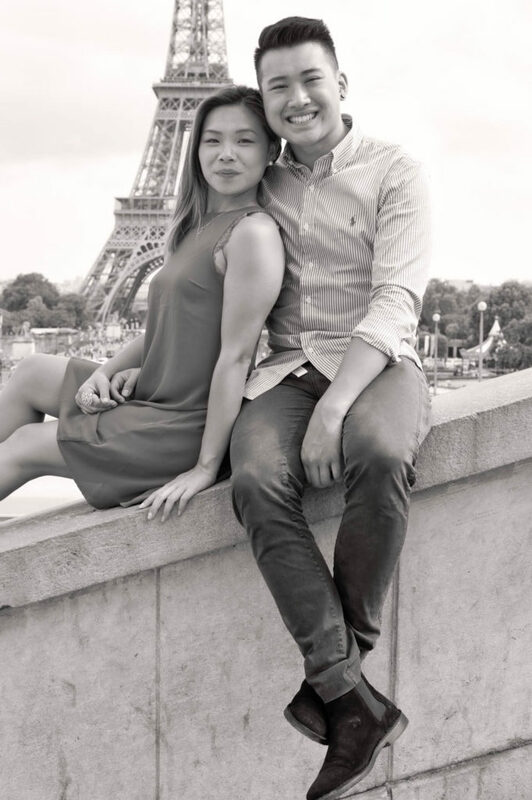 Joe ordered our “Edith Piaf” gourmet picnic at the Trocadero gardens including one hour photo session with Olivier once our couple had enjoyed their lunch and cracked open the bottle of champagne. 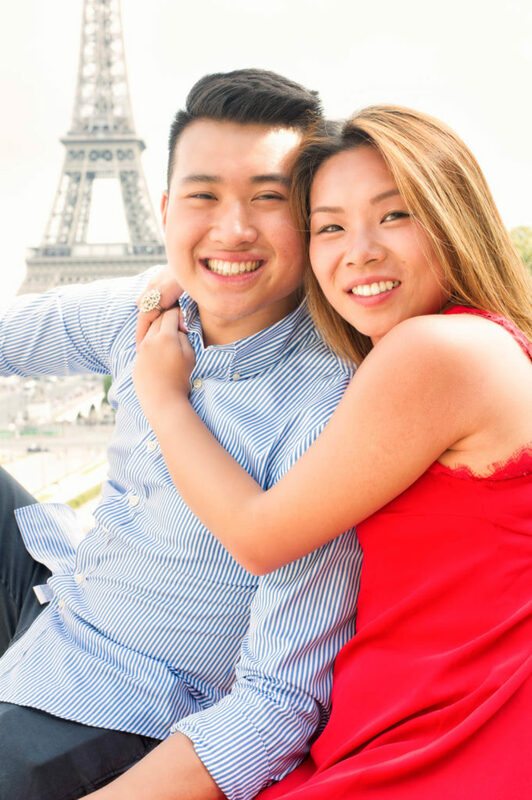 The Trocadero area is great for photos. 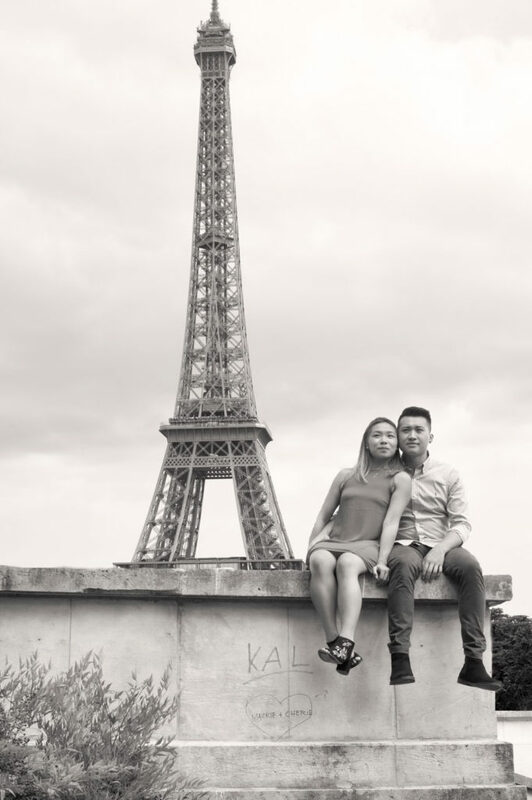 It is located on a hill overlooking the seine and the eiffel tower which you can admire in the distance. It is an amazing view point for photography. 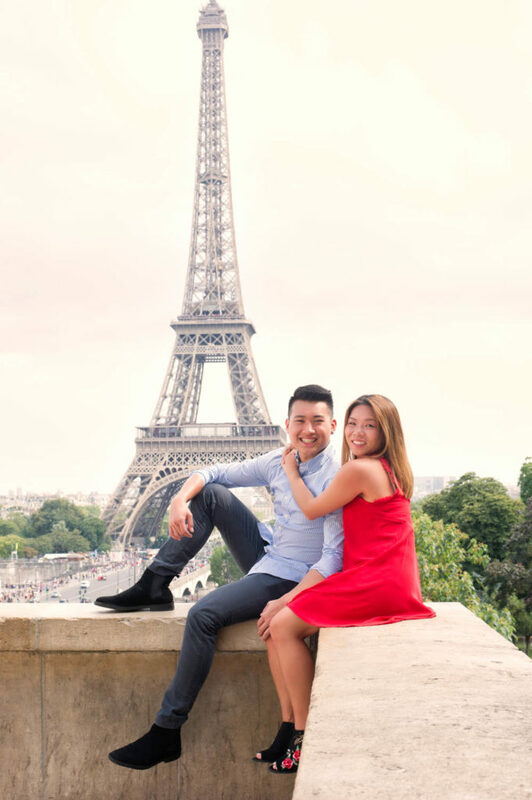 Although it can get a little crowded at time, the trocadero area is definitely a prime location for some great photography with the Eiffel tower and the city scape. We are now starting to take bookings for the spring season. 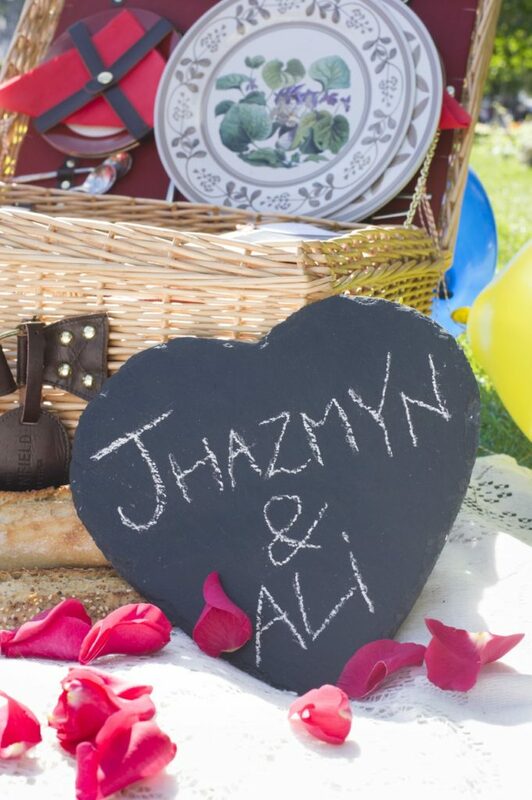 We have had a few couples contacting us to plan their surprise gourmet picnic already. A few of you have reserved their date for their forthcoming secret proposal too. 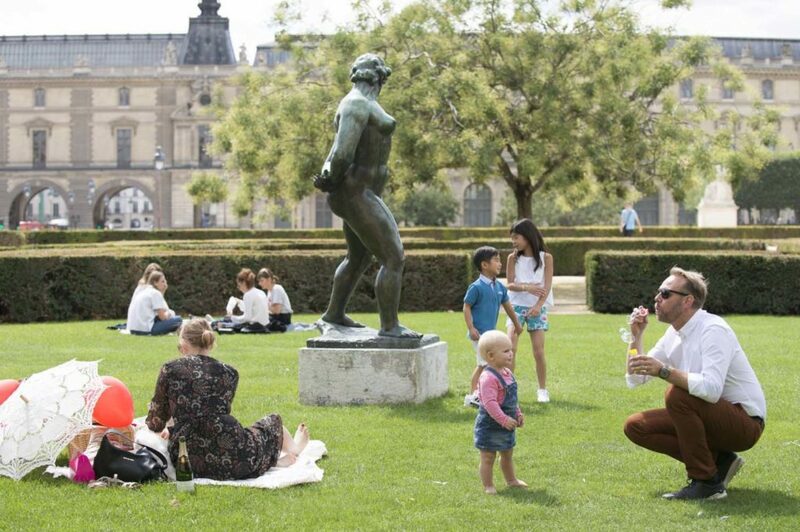 We are now proposing picnics and photography in the gardens of Versailles this year as well. 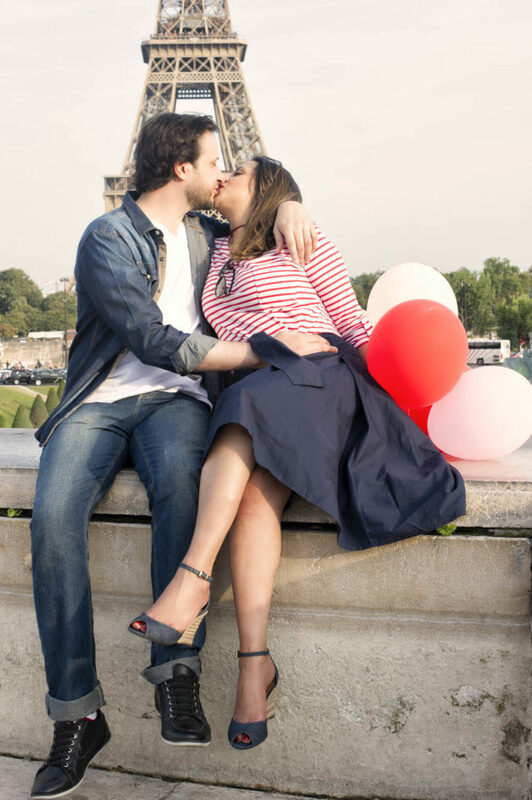 First steps in planning a secret proposal with Love Picnic Paris. 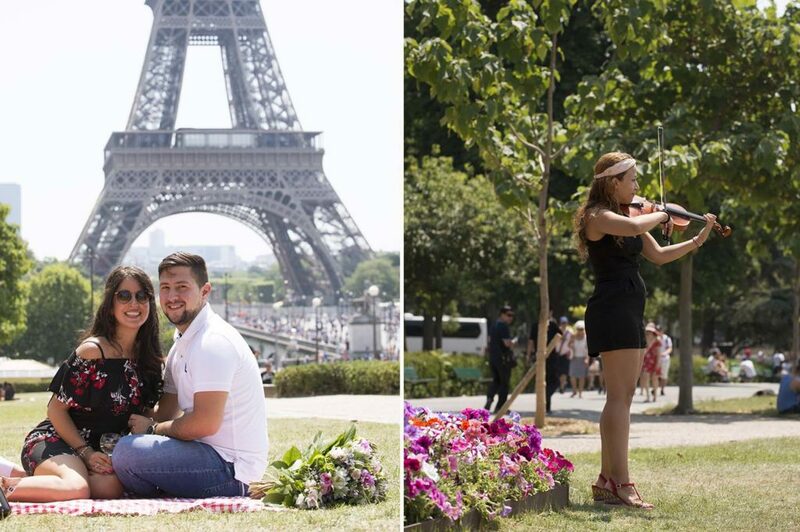 We have created a new secret proposal information page to our Love picnic Paris website. We now combine our surprise gourmet picnic adventures with different photography packages around the city. 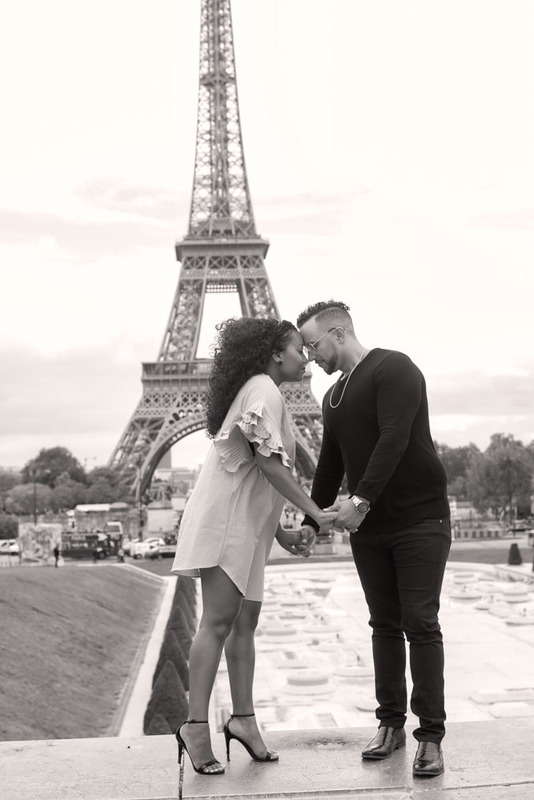 If you are considering proposing to your love one while visiting Paris, it might be a good idea to go through the page. We explain in more details the different types of services we propose to make this moment unique and completely stress free! 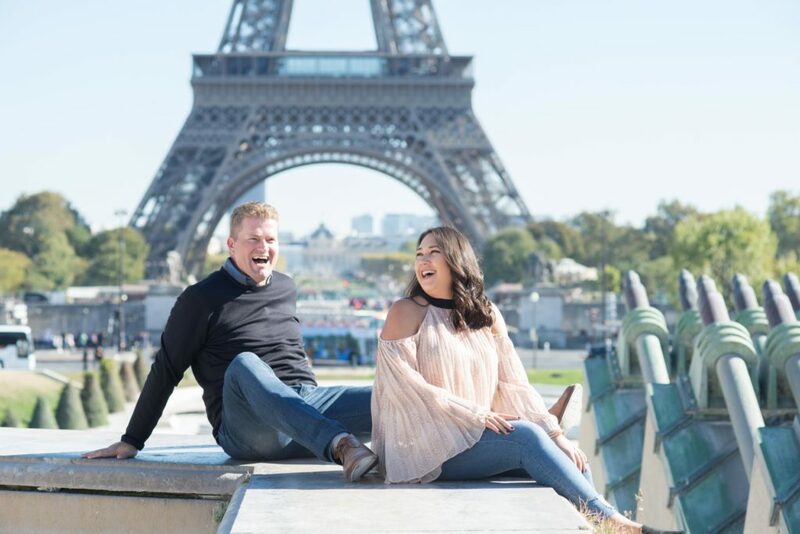 Joe and Ella’s engagement proposal in Paris. You are more then welcome to reach out to us via email directly if you have any question you would like to bring forward. 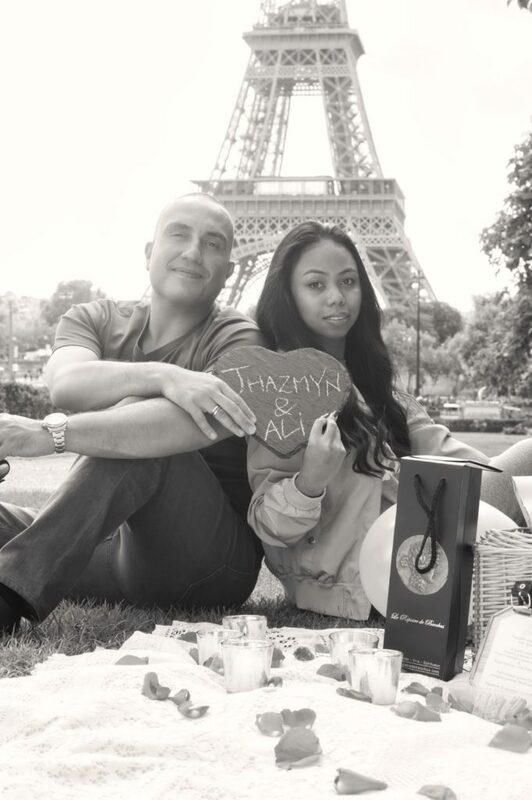 We understand the stress involved when planning such a special moment from far away. 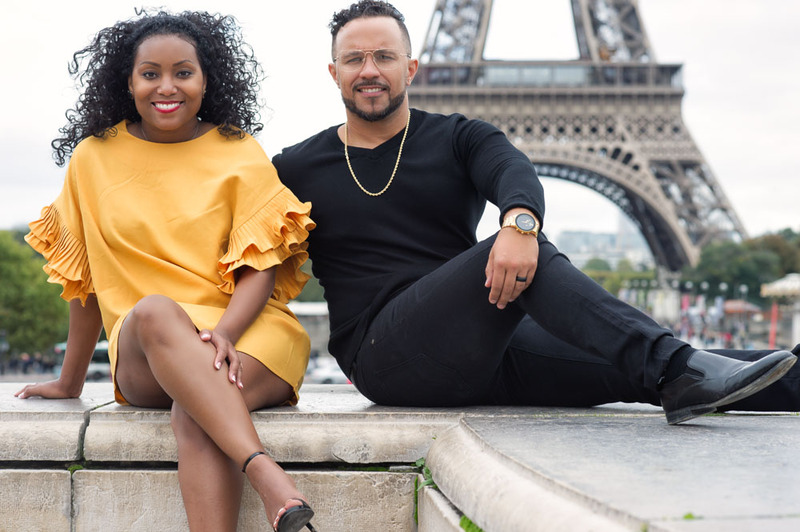 This more so if you have never been to Paris before. Each and every one of our services can be customized to your liking. 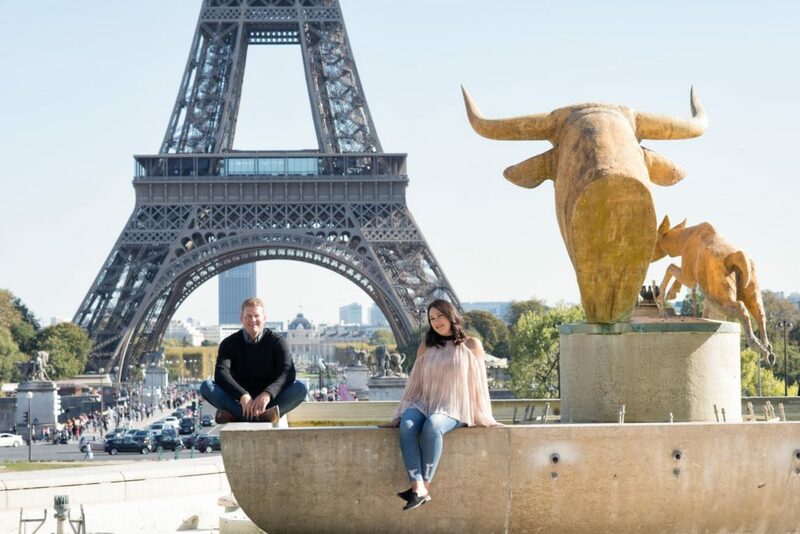 We have now gained extended experience in planning secret proposal with the Eiffel tower in the background but not only! So you are more then welcome to reach out for more details, we would be so glad to be part of your special day. 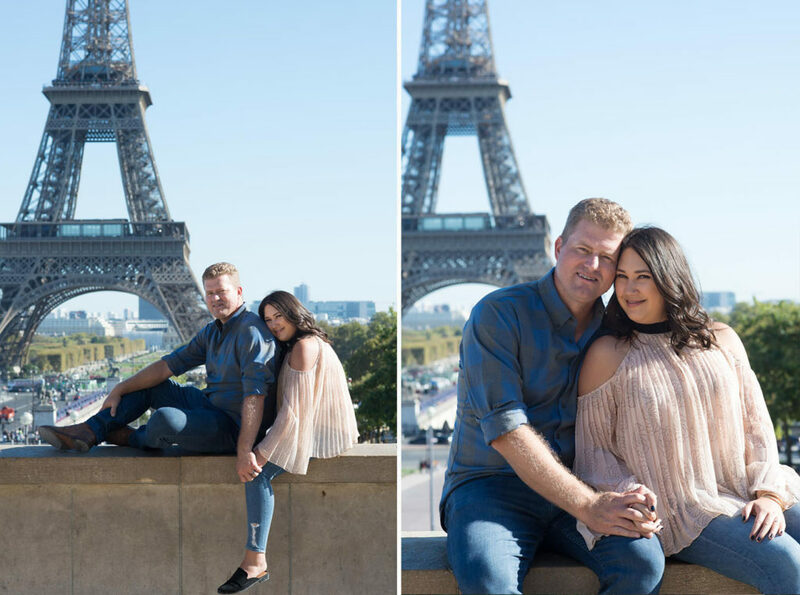 Meanwhile enjoy the few engagement photographs with Joe and Ella’s engagement photo session, taken in Paris recently with Olivier. 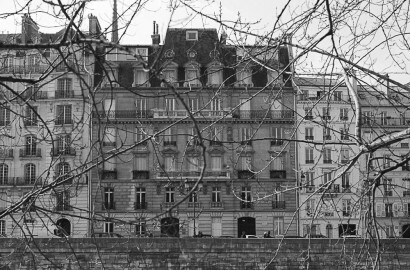 If interested in a private photography session while visiting the city, I would suggest that you go to Olivier’s website to get familiar with his style of photography. 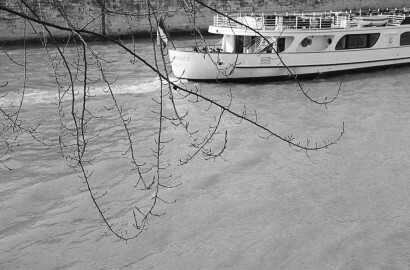 Alternatively you can go to our gallery page where you will find a selection of photographs taken with Olivier those past couple of years with Love Picnic Paris. I have just gone through the slideshow myself. It brought a tear to my eyes looking at all of this love and happy faces! 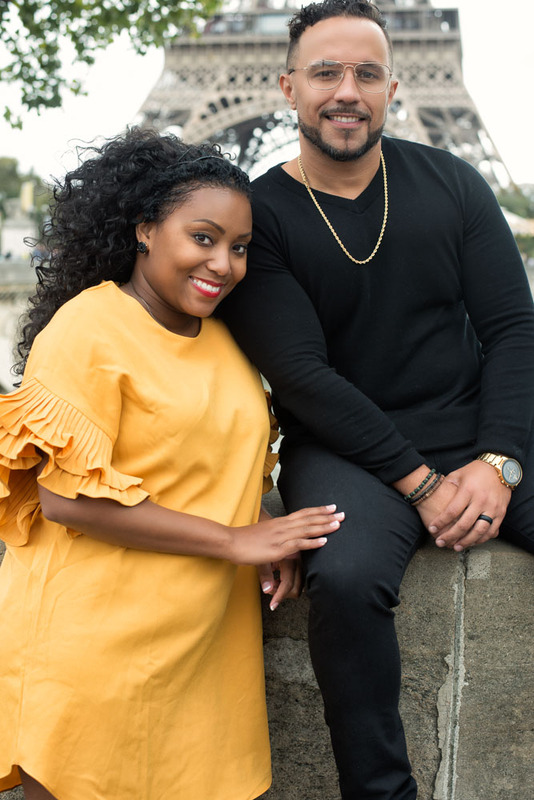 We had a beautiful day in Paris yesterday. The fall season has simply been gorgeous . It has been a lot of fun to stretch our summer picnic season a little. We actually organized a gourmet family picnic yesterday. 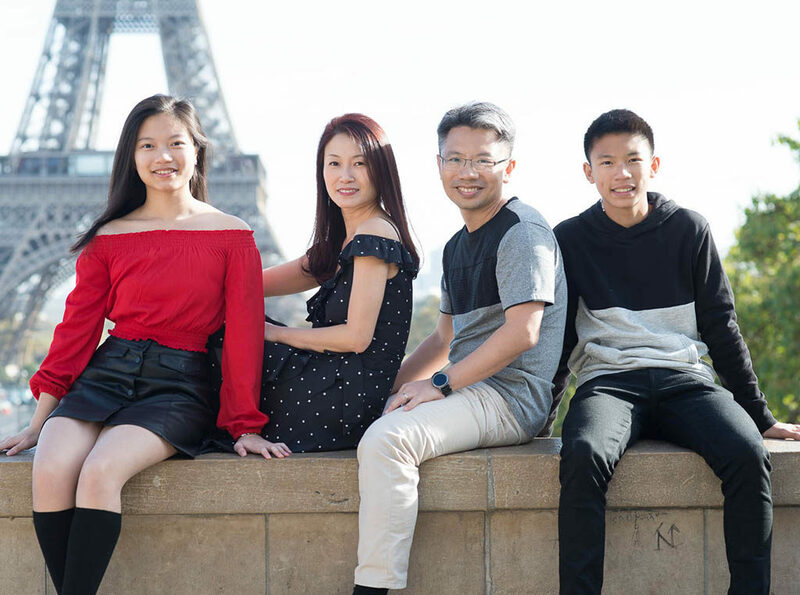 It was coupled with a photo session with our photographer Olivier around the Trocadero area for a family of four from Singapore. 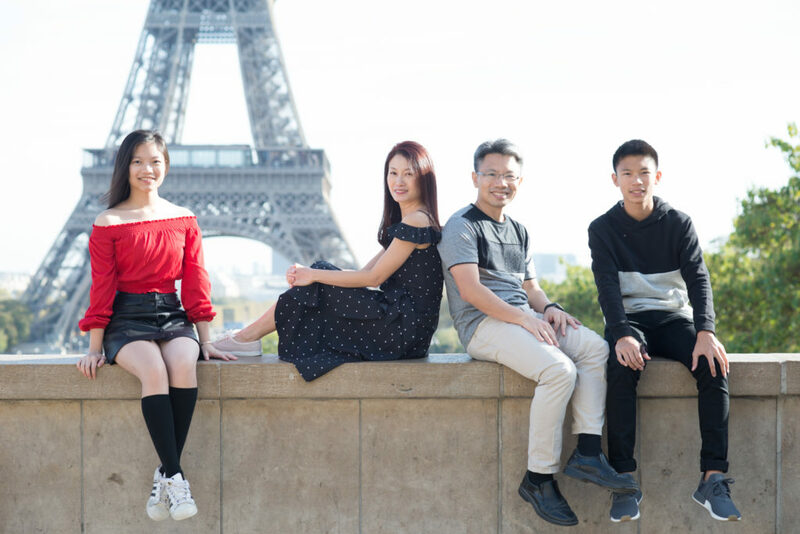 Miss Chin Yeng Choo asked us to prepare a picnic at the footstep of the Eiffel tower while they were visiting Paris. 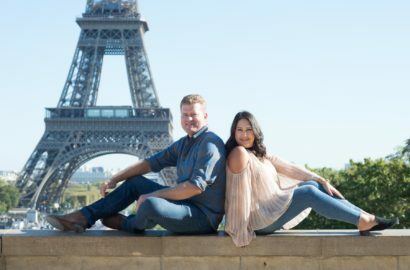 They visit Paris every 5 years and we are so glad they contacted us this time around. The kids are now all grown up. 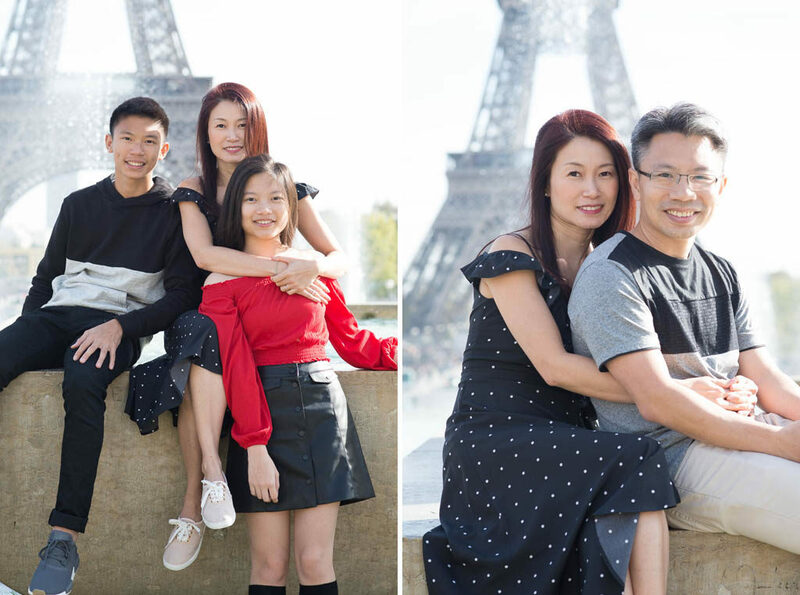 She wanted to take the opportunity of a family trip to Europe to have a professional photographer take a few portraits of the family. 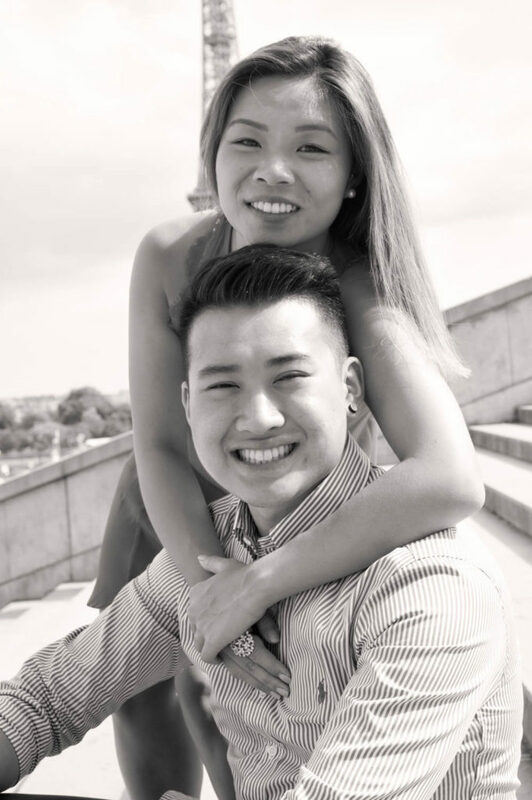 We are lucky to have a very talented photographer under our roof! 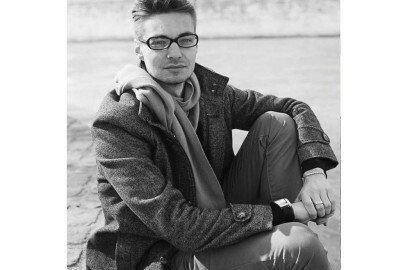 Olivier happens to be my partner in crime and the co founder of ” Love Picnic Paris”. 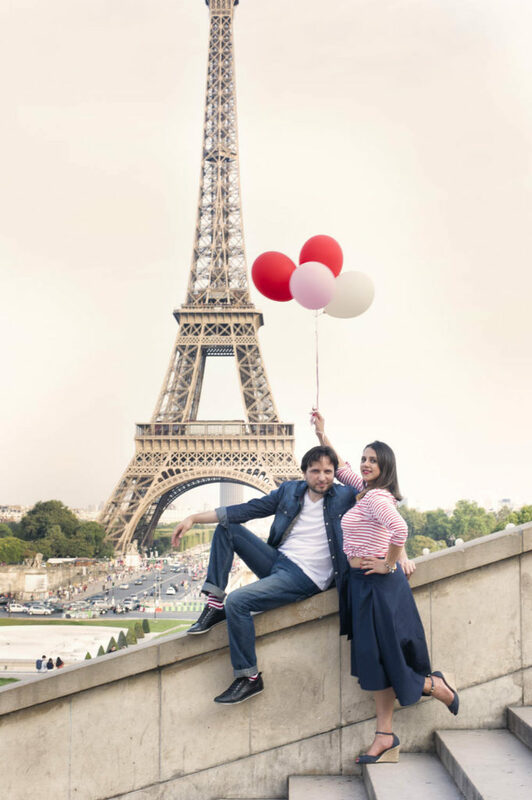 This way, we propose fun and creative photo session along our picnics with one of the best photographer in town! 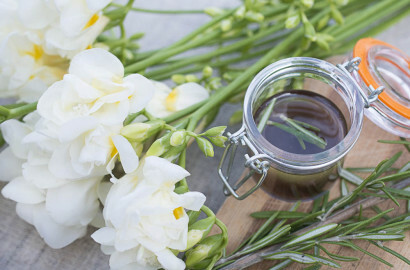 You can visit Olivier’s creative wedding work on his website. His photo are fun and natural yet stylish and creative. 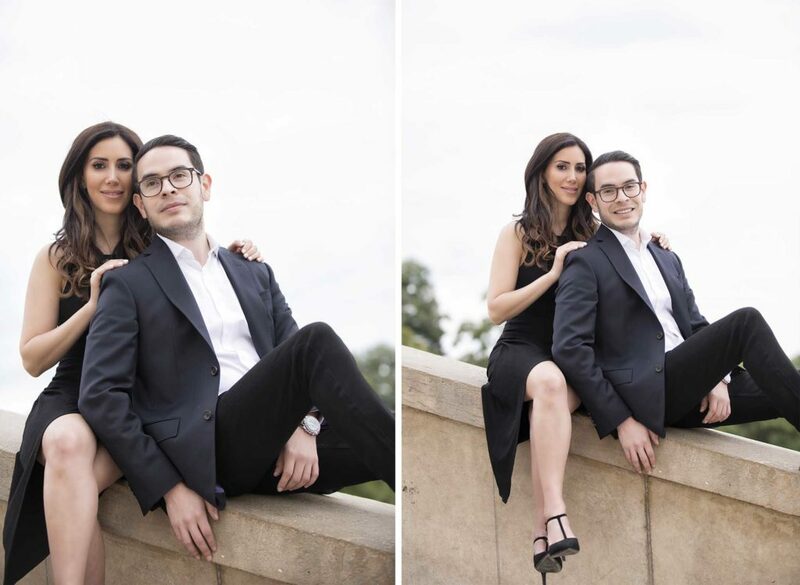 He shoots in a lifestyle manner and always make sure that his clients are having a great time in front of his lens! I am myself camera shy. 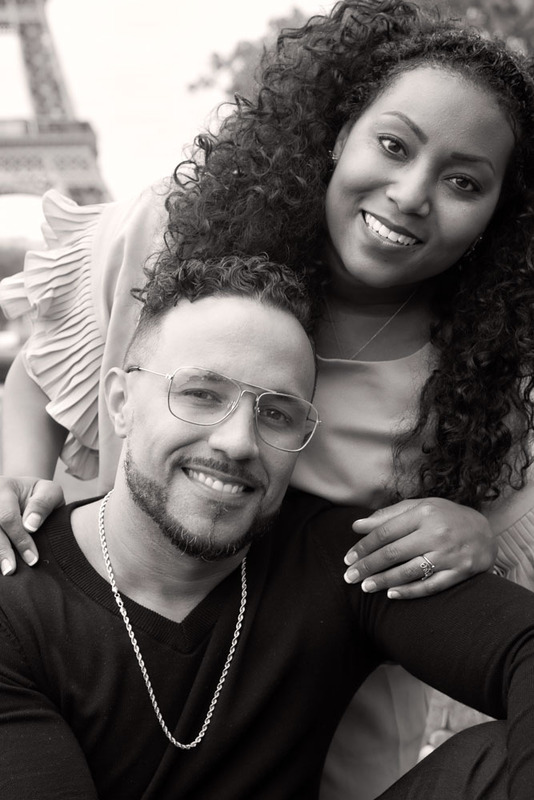 Having a photographer who can make you relax and simply enjoy the moment makes a whole lot of difference. 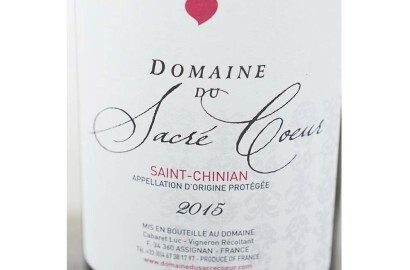 This is where real craftsmanship, passion, experience and dedication will make the final result unique and the experience a long lasting happy memory. 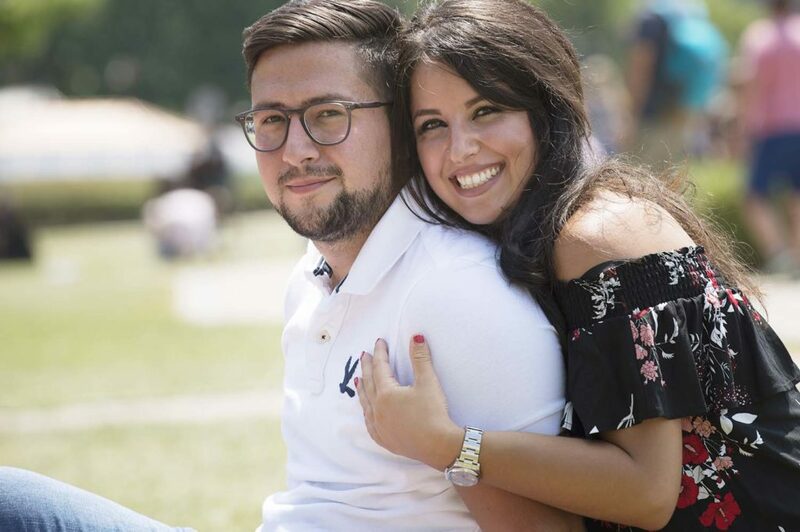 Our picnic experiences are unique so are our family and couple photo session. While our summer picnic season is reaching an end, we are just about to launch a winter gourmet picnic special! 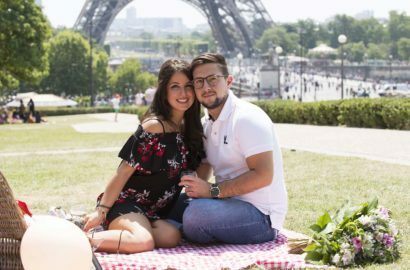 The menu is not yet finalize but soon you will be able to enjoy a winter picnic at a couple of romantic locations in the city. We will provide hot wine as well as tea and hot chocolate with our delightful baskets. 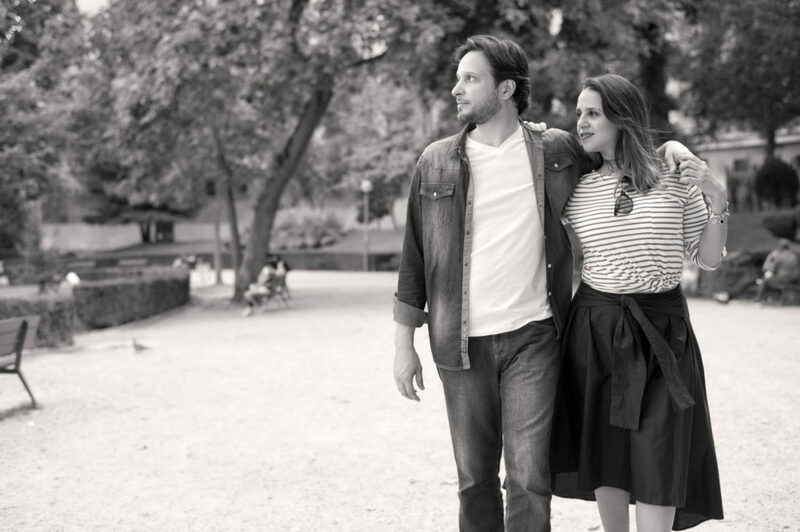 Romantic photo session will still be going strong through the winter months as well. Stay tune for more details and reach out to us via email for more details if you are too impatient and curious. 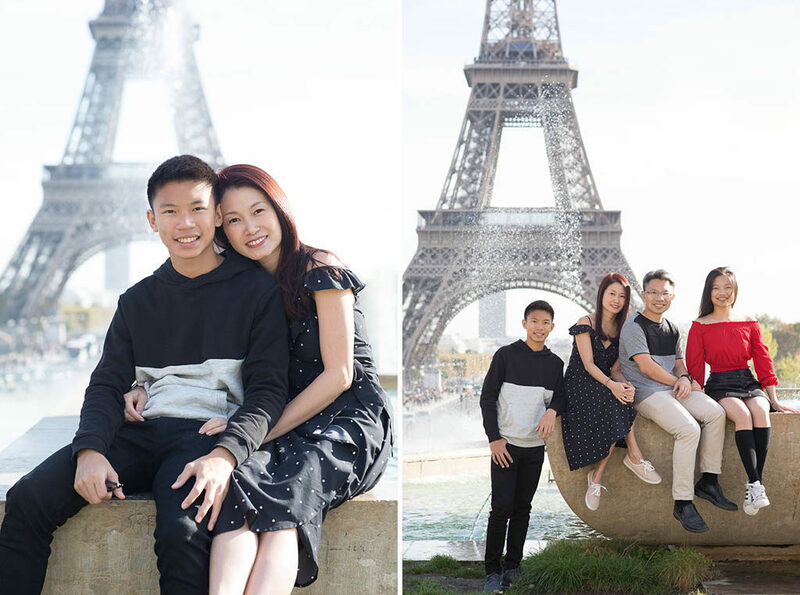 In any case, I hope you enjoy the few family photos taken at the Trocadero yesterday with the Choo family. 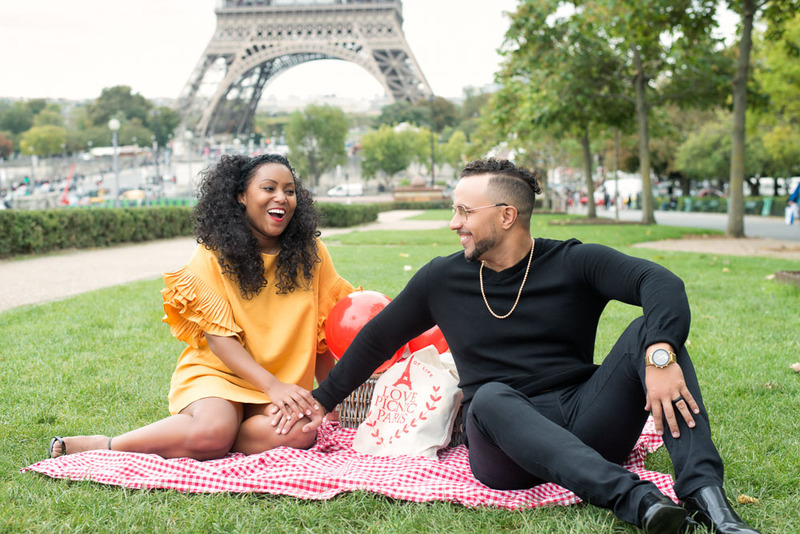 Paris picnic and a couple photo session. 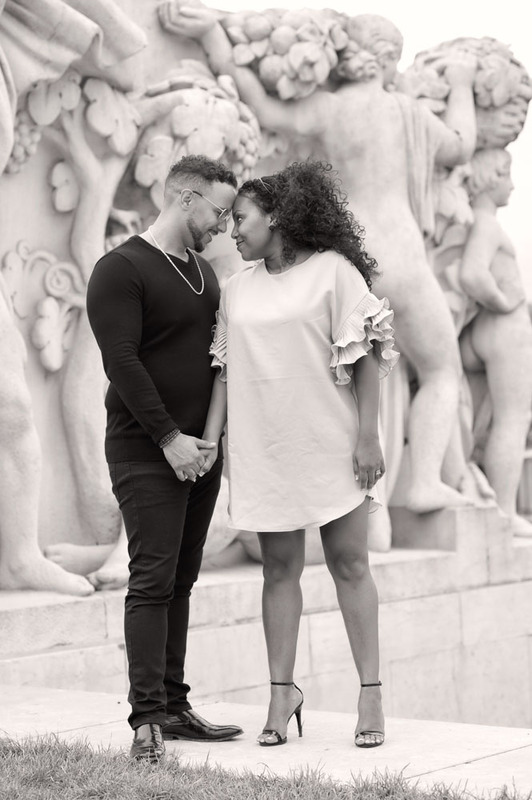 We have had a gorgeous month and october is even more beautiful … You are in the city with the intention to propose to your girlfriend, or simply visiting with your love one … You are looking for something unique to do, something utterly romantic! 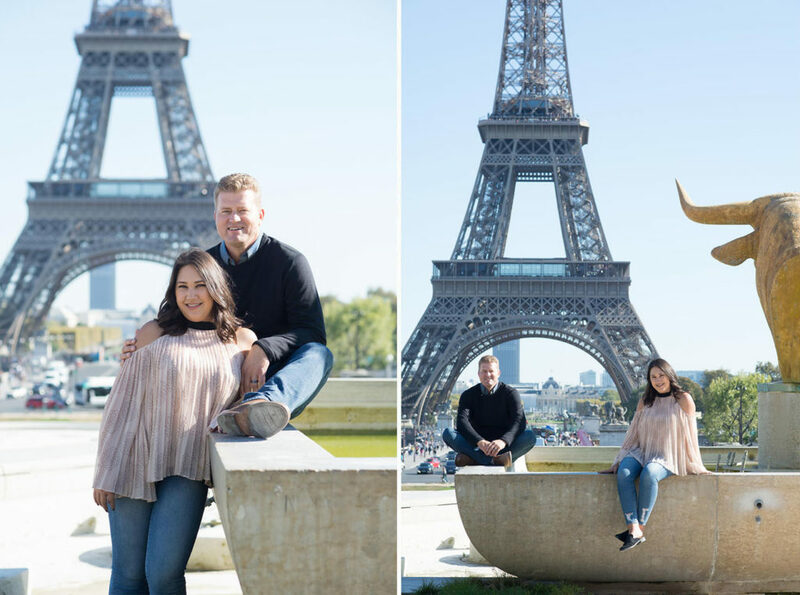 Well, it is the perfect time to enjoy one of our gourmet picnic and a couple photo session at the Eiffel tower, just like Ashley and Kent did yesterday. 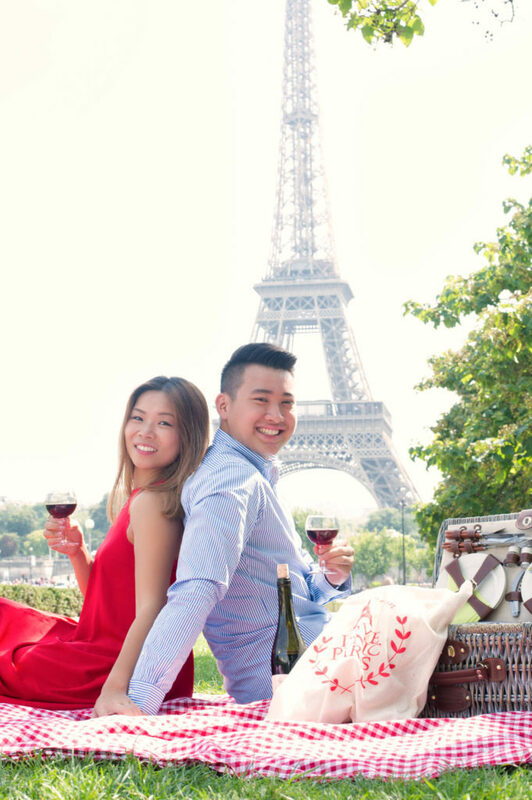 They flew from California; first time in Paris, a gourmet picnic overlooking the eiffel tower is a wonderful Parisian experience. 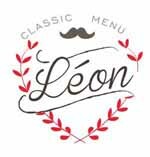 Ashley had contacted us a while back to arrange for our “Leon picnic ” and a photo session with Olivier. 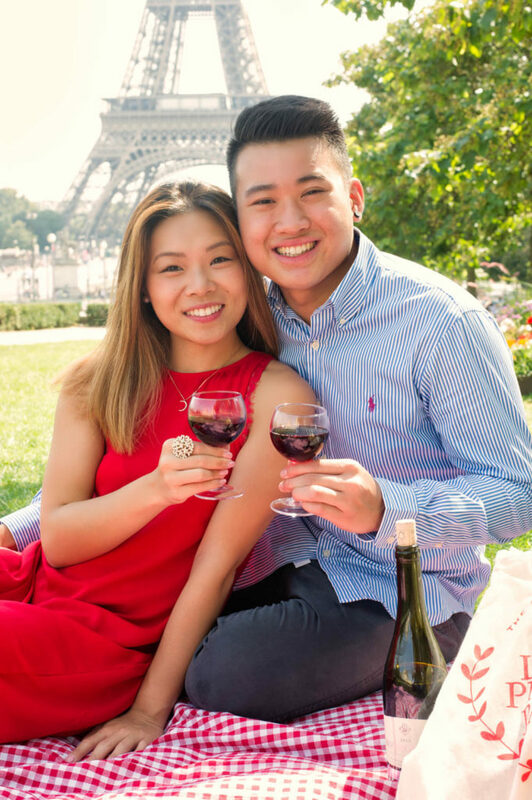 We set up their picnic at the Trocadero gardens so that when they arrived at the location, all they had to do was open the bottle of wine & enjoy this special moment. 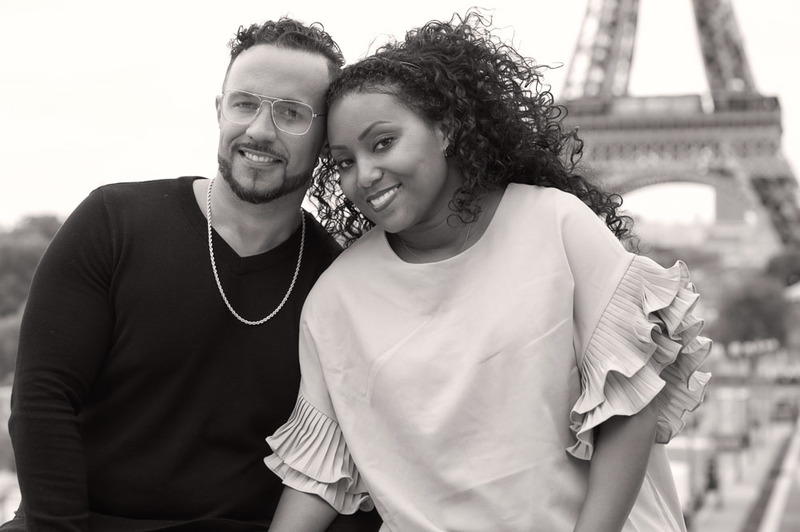 Olivier met up with them an hour later for their couple photo session. 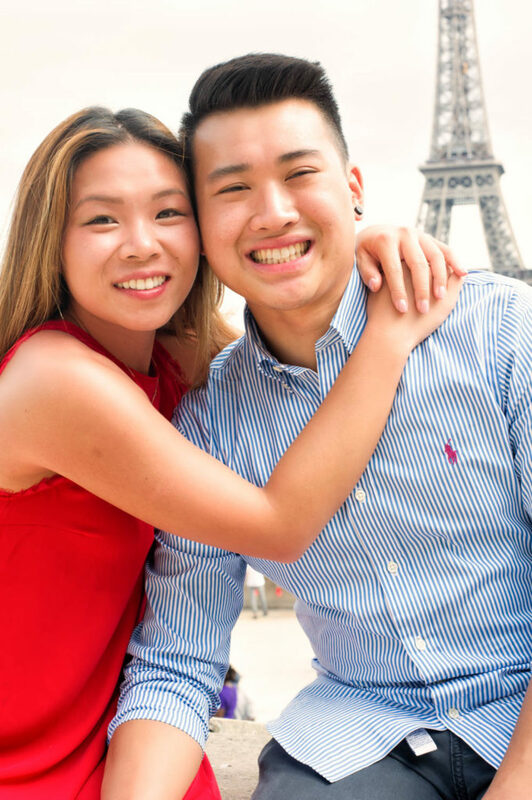 They had booked a mini photo session with us to complement their romantic afternoon. 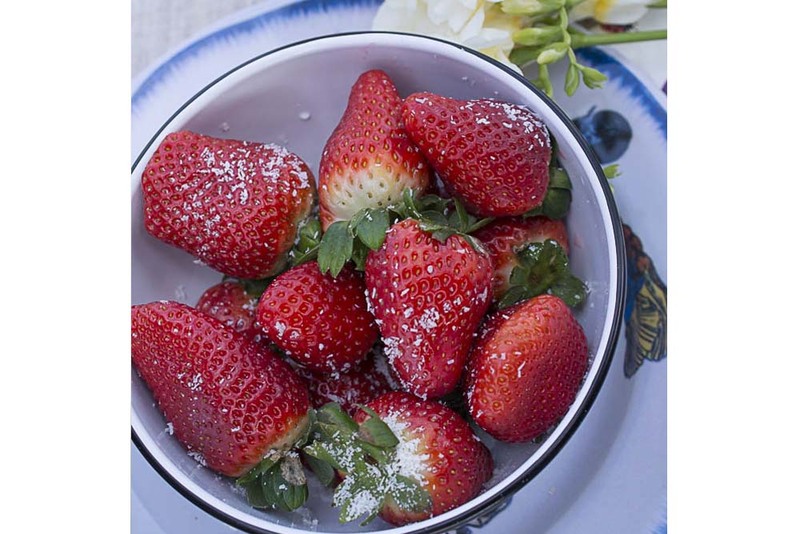 A gourmet picnic and lifestyle photography. 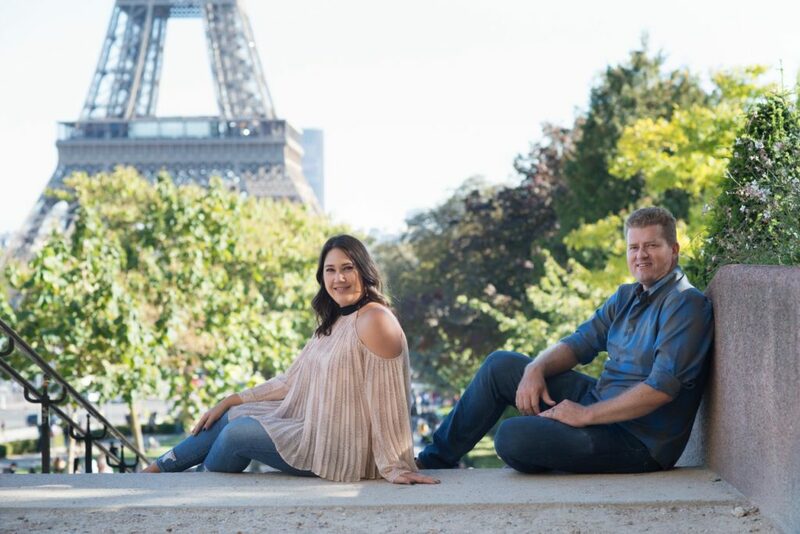 Our latest secret proposal venture combining a gourmet picnic and a mini photo session at the gardens of the Louvre with our photographer. 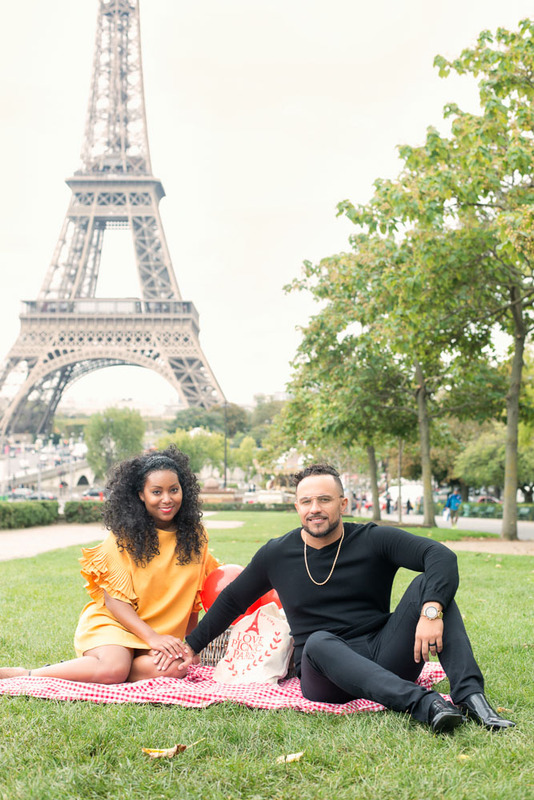 When we started ‘Love Paris Picnic ” the idea was to share our love for picnics, outings with friends and creative photography. 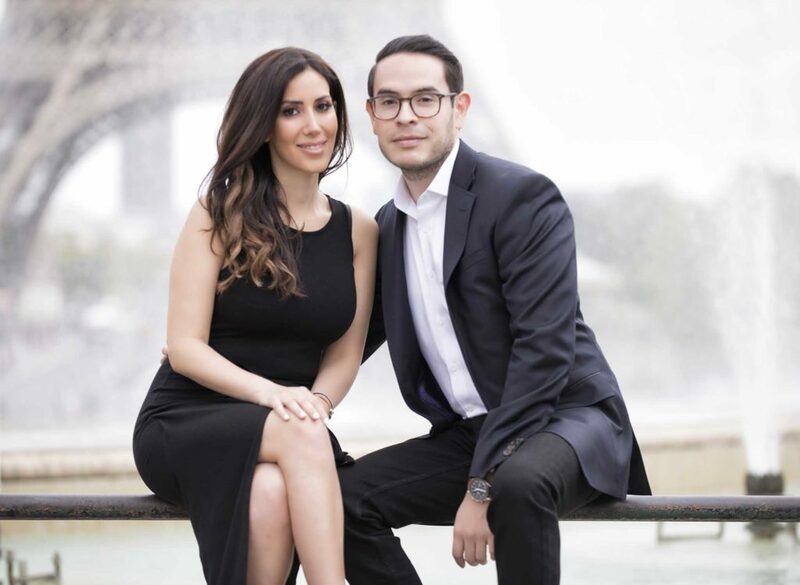 Olivier is a very talented photographer with a vast experience in lifestyle and portrait photography. 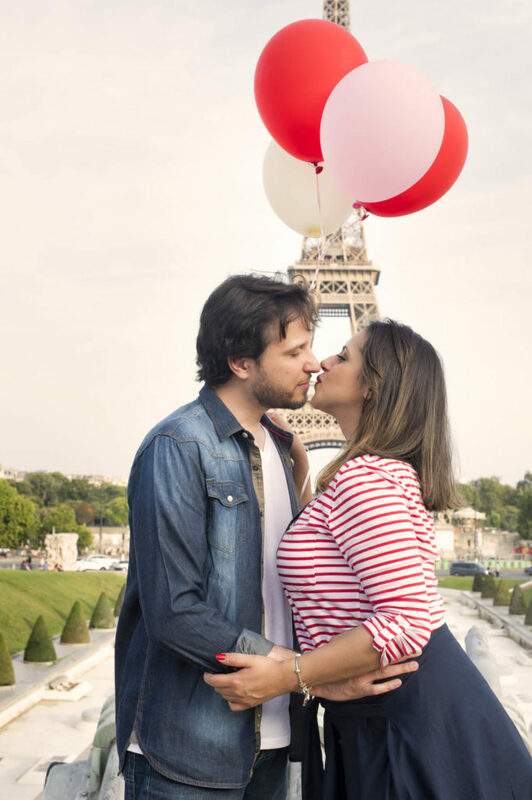 Paris being the city of love, we quickly found our marks, catering for very special secret proposals but not only! 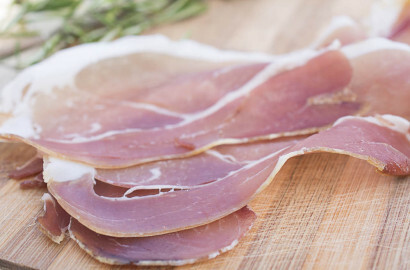 You can of course order a gourmet picnic from us via our picnic order page. We have four different gourmet picnics to choose from. I have to say that it is a real delight to organise a secret proposal in our wonderful city for our international clients. 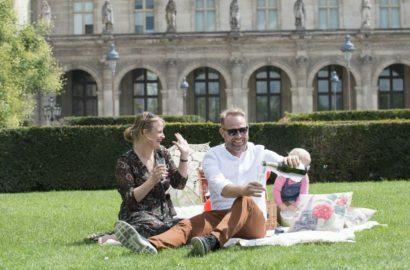 It is equally rewarding to prepare a delightful picnic in one of our wicker basket for friends, families and partners in crime who wish to have a special experience in Paris, something that is truly a “French tradition”. 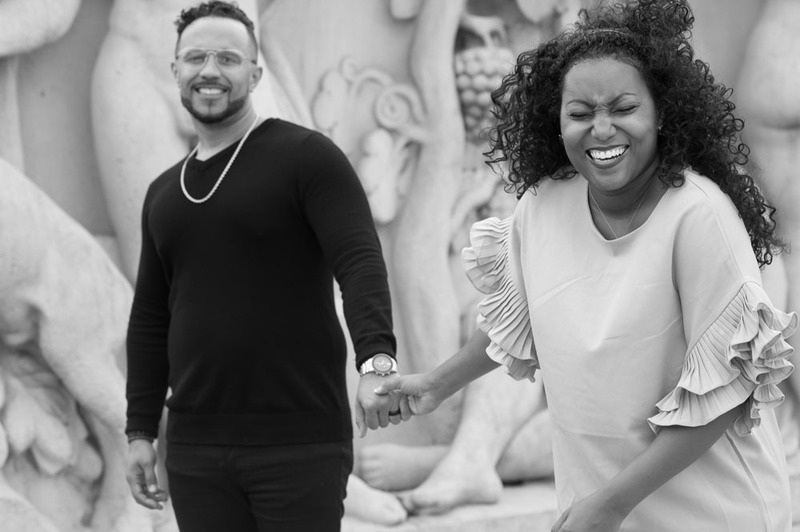 Back to our lovers outings, we assist you with finding the perfect site, a romantic and peaceful setting. 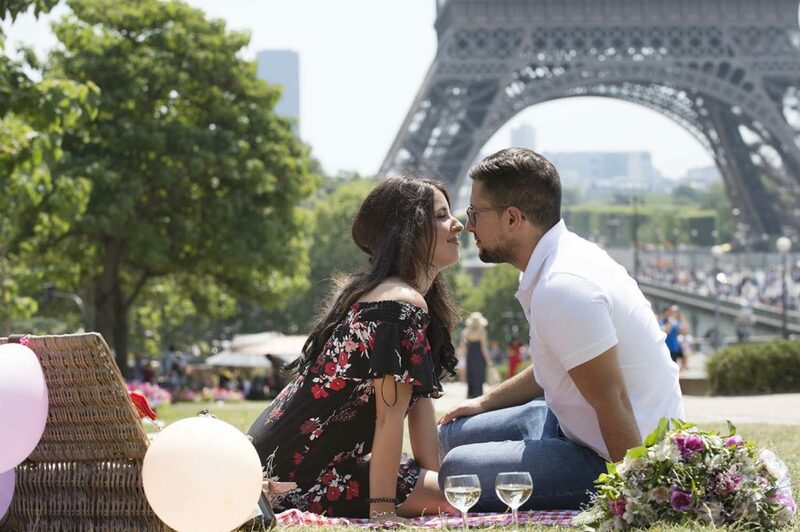 We will set up the most romantic gourmet picnic with one of our wicker basket, lovely cushions, candles, umbrella to shade yourself from the sun if need be. We would also dismantle the set up once you are finished so that you can carry on with your visit without having to worry about returns. As to photography! 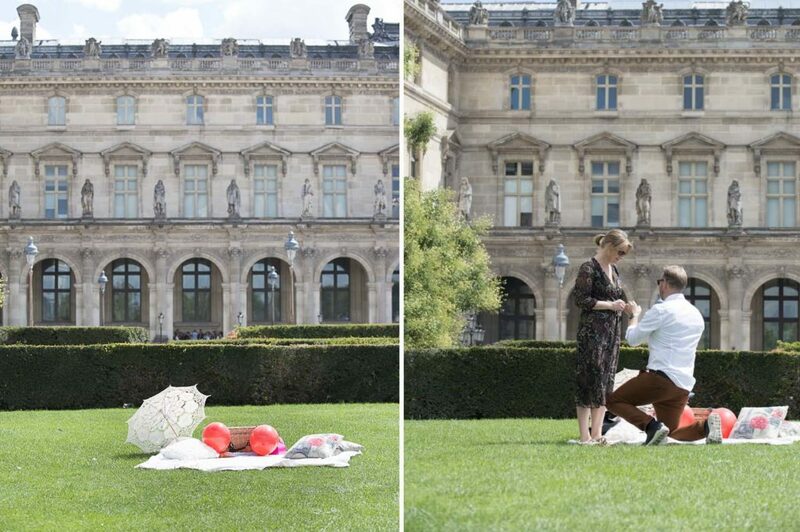 Olivier would document your proposal from the distance in a discreet fashion. This way you have some creative visuals of a very important moment in your life. 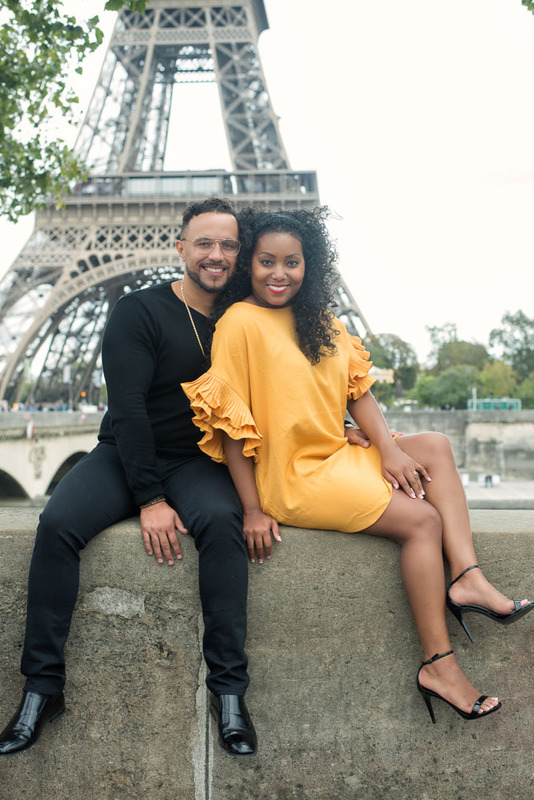 The photos would be retouched and sent out to you the next day so that you can share your love with friends and family while still vacationing. 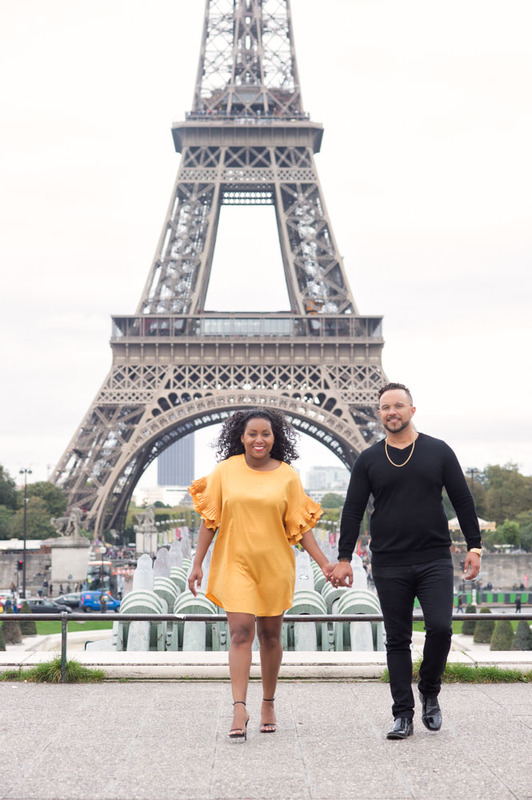 Here is the page where you can choose one of our designed lovers package if you plan on proposing while visiting Paris. 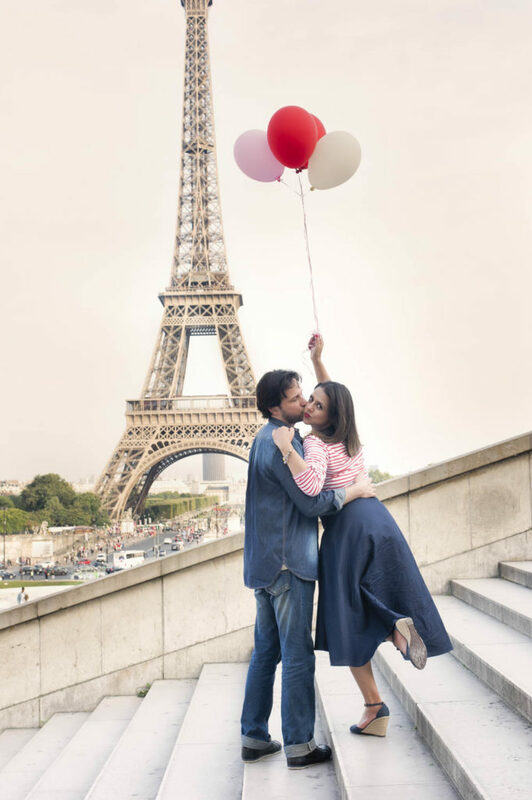 Paris secret proposal: Three different packages combine a gourmet picnic with a creative lovers photo session. 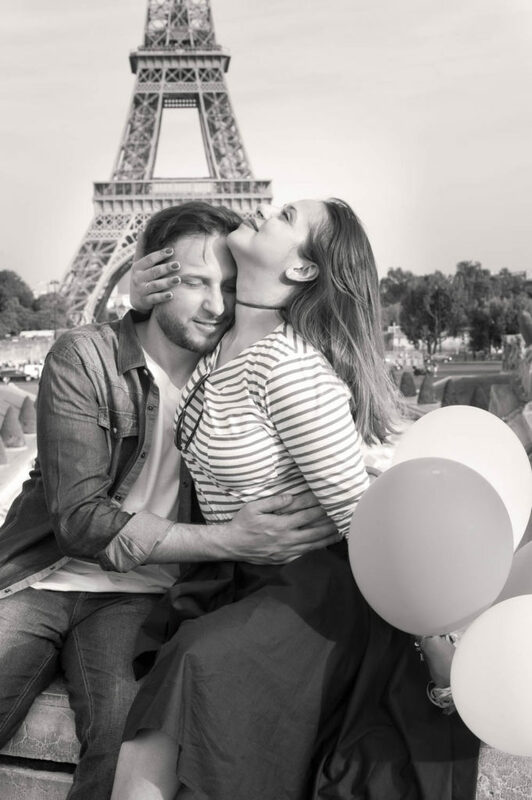 We have actually put together different packages specially catered for lovers that combine one of our delightful picnic with a photo session in the streets of Paris from a mini 1/2 hour photo shoot to an extensive 3 hours photo tour at some of the most beautiful Paris landmarks with Olivier. 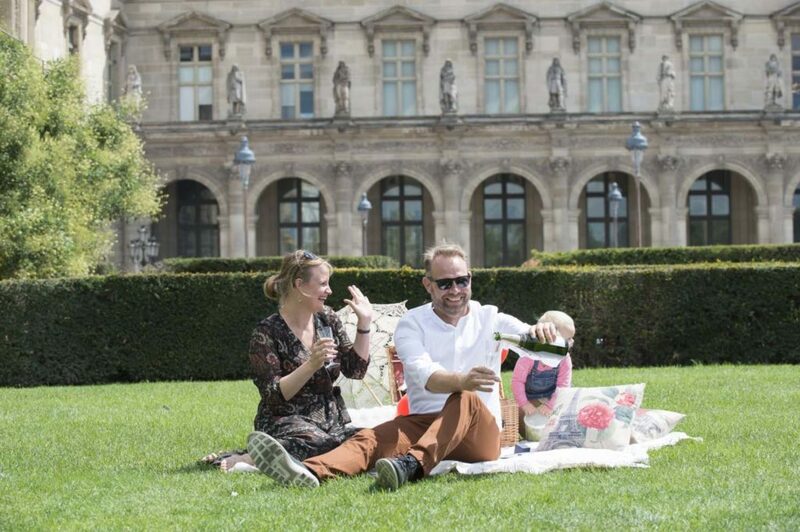 Our picnics are usually set up at the gardens of the Trocarero, the gardens of the Louvre or the Luxembourg gardens. 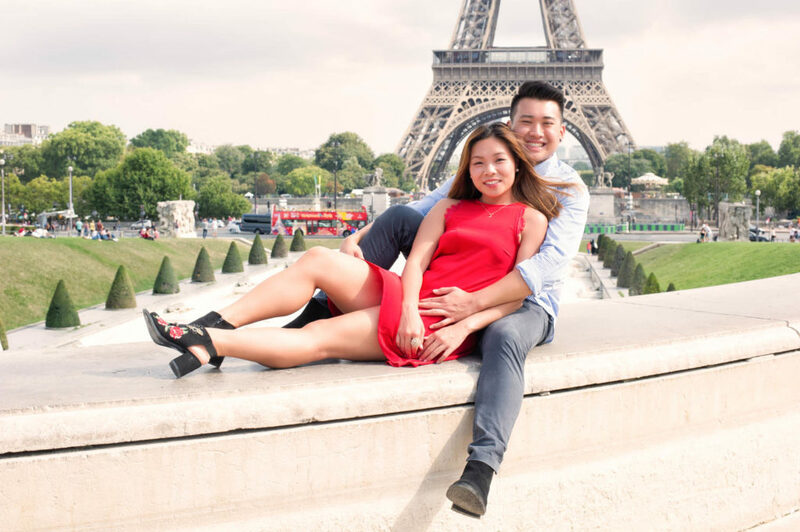 All three Parisian locations have their own specific charm and atmosphere. We love them all! 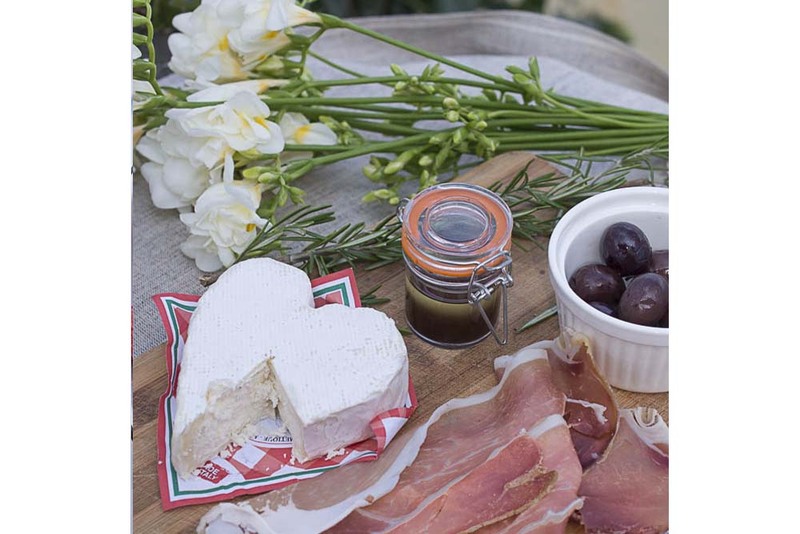 Our picnics can be tailored to your specific needs as well. We have actually put together a vegan picnic recently for one of our client. This was a new experience for us. 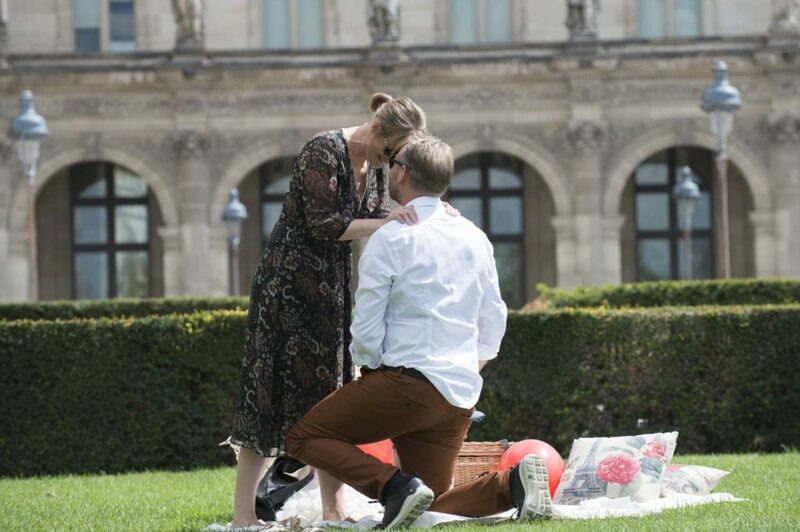 Jamie proposed at the Louvre gardens. It was a fun event to organize. 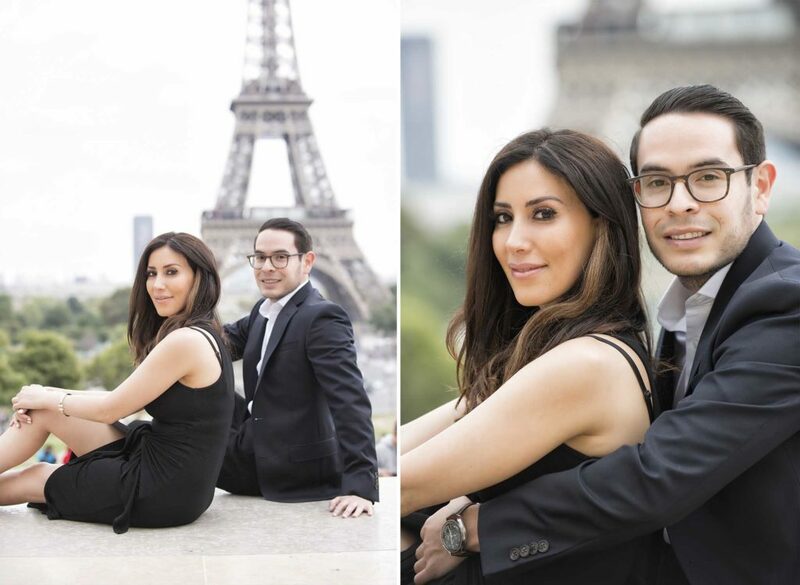 Here are some sample photographs taken by Olivier during the proposal. 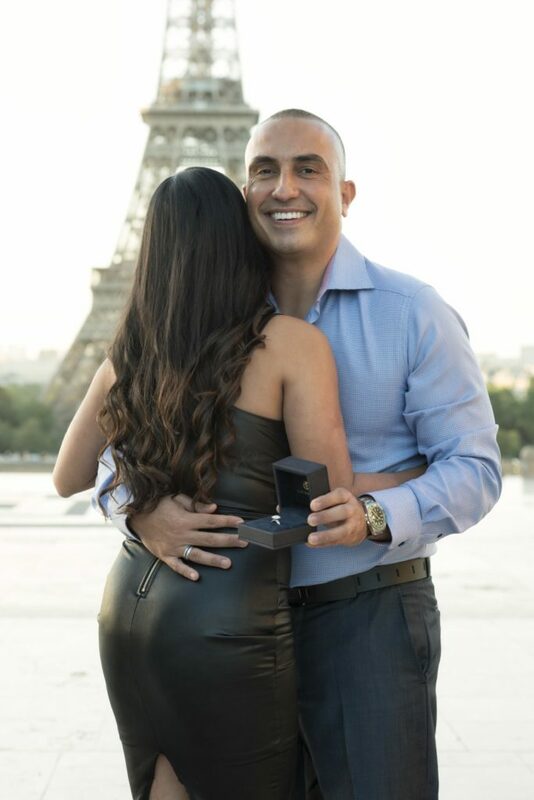 Paris secret proposal – The Louvre. 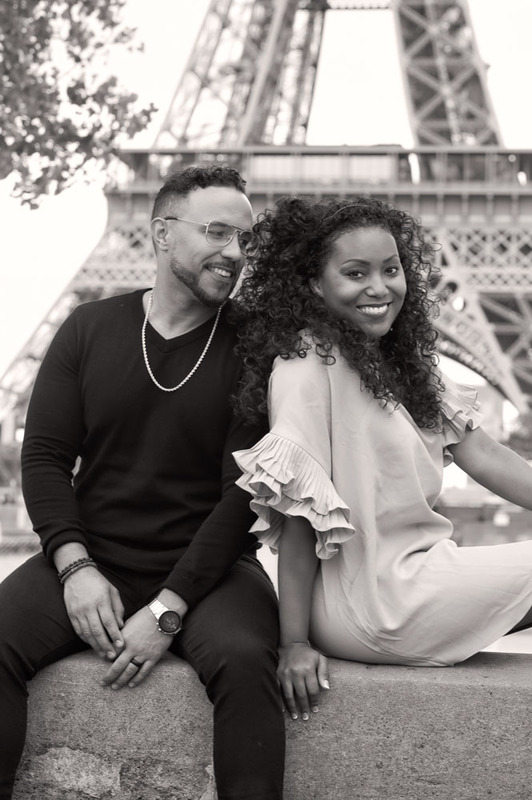 “Love and Happiness”; I was listening to this gorgeous song from Al Green looking at some of the photographs that Olivier took at the Trocadero gardens on a lovely afternoon. 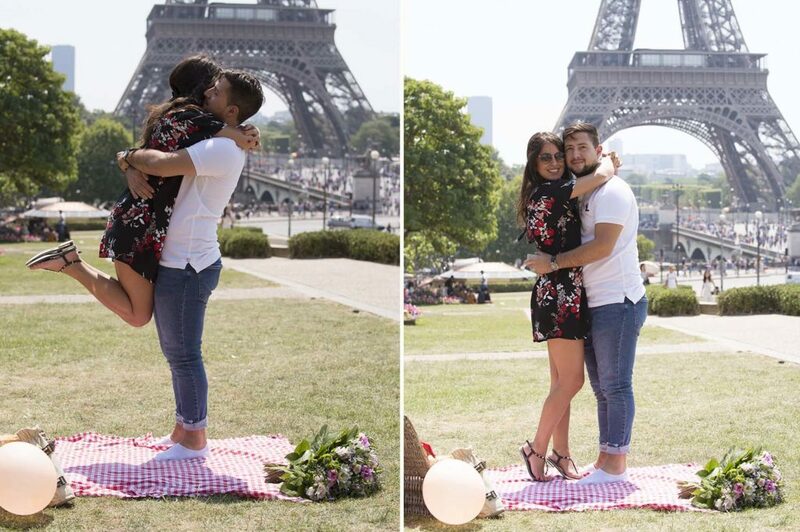 Mehmet proposed to his girlfriend at the gardens of the trocadero a few days back. 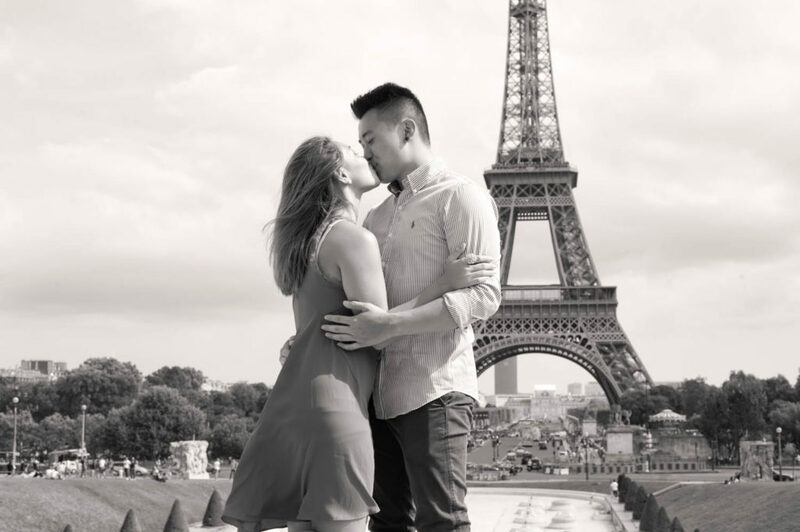 A little curious crowd gathered as he was kneeling down to propose and clapped for the finale kiss. 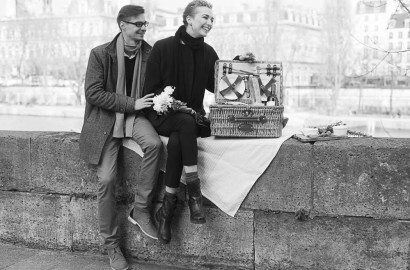 We organized our edith Piaf picnic for them coupled with a violonist who played a few romantic tunes, a seasonal bouquet of flowers and some great photos from the best photographer in town! Oh I forgot champagne was flowing at Mehmet and Efie engagement. 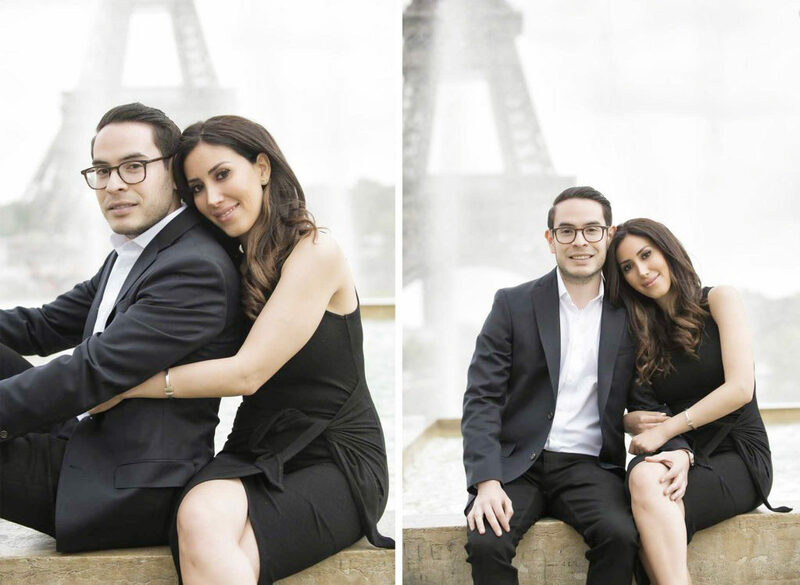 Another beautiful photo story taken by Olivier at the Trocadero gardens with Jen and Patrick. 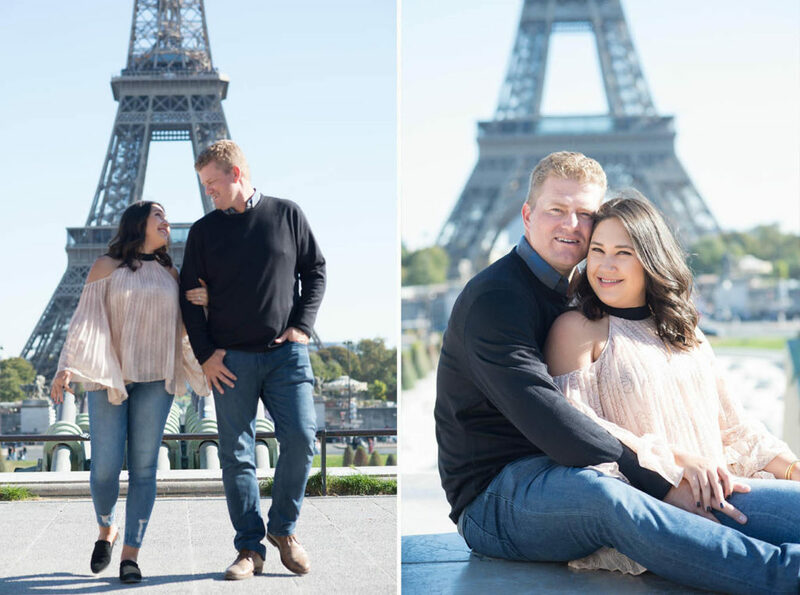 It was Jen’s birthday and their three years wedding anniversary that they celebrated with one of our picnic basket and a romantic photo session around the Eiffel tower. AGAIN I LOVE THOSE PHOTOGRAPHS, they convey real happiness and the special bound that those two share with each other. 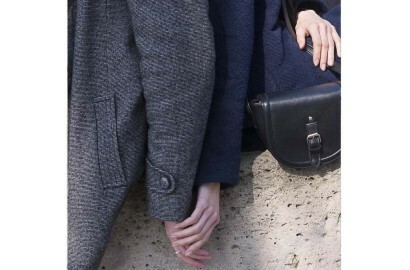 The photos are fun and natural, so much that it seems that they have been snapped away by a friend! Well no, they were taken by one of the most amazing photographer that I know, who simply has mastered his craft! 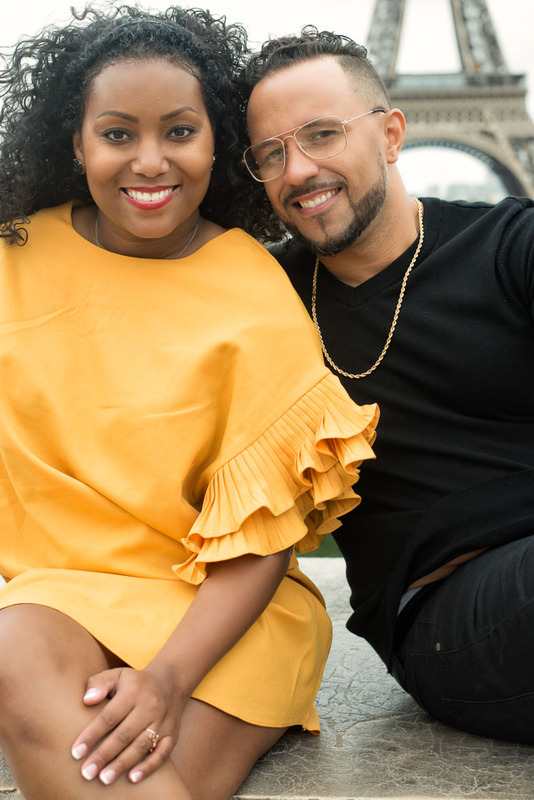 Andreia and Julien photographed by Olivier during their engagement picnic at the gardens of the Trocadero in Paris. 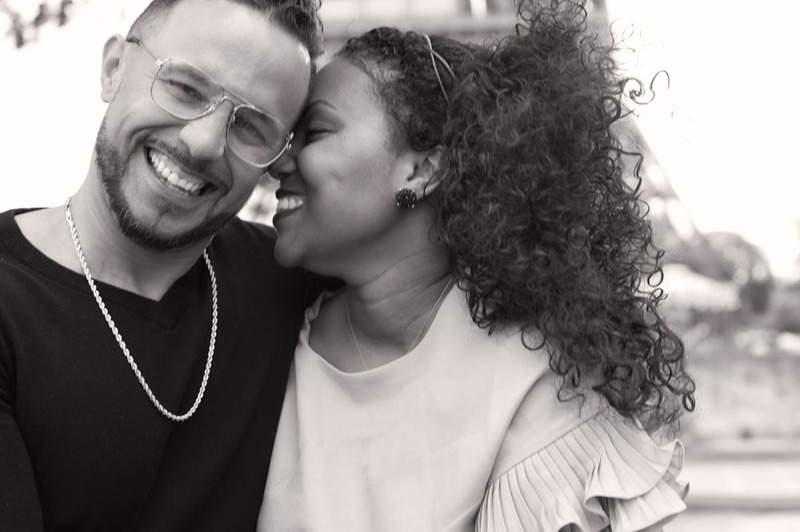 You can tell that they had a wonderful time during their romantic lunch + engagement photo session yesterday. The weather is simply gorgeous in Paris at the moment. 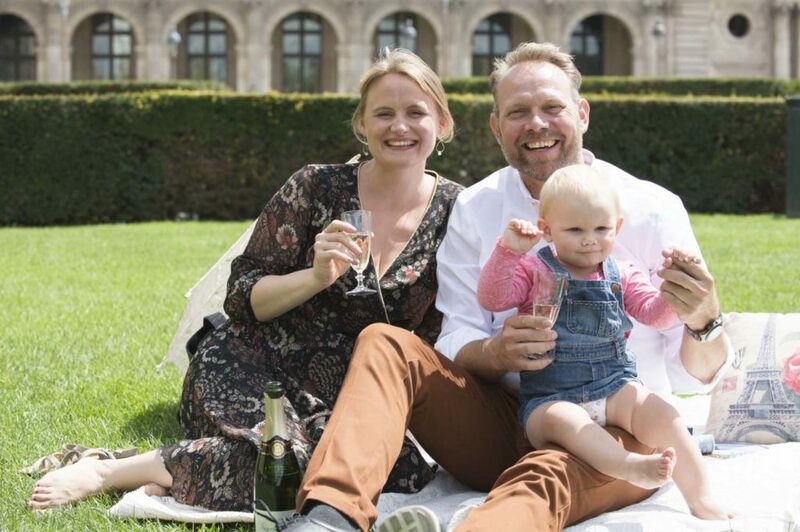 It is the perfect time to enjoy one of our gourmet picnic with family and your loved ones! Looking at those photographs, I am considering to prepare a picnic for ourselves this week end and take off to Versailles for the afternoon. We might just exceptionally be closed on sunday! I am so jealous of our clients right now and I want to do exactly the same. 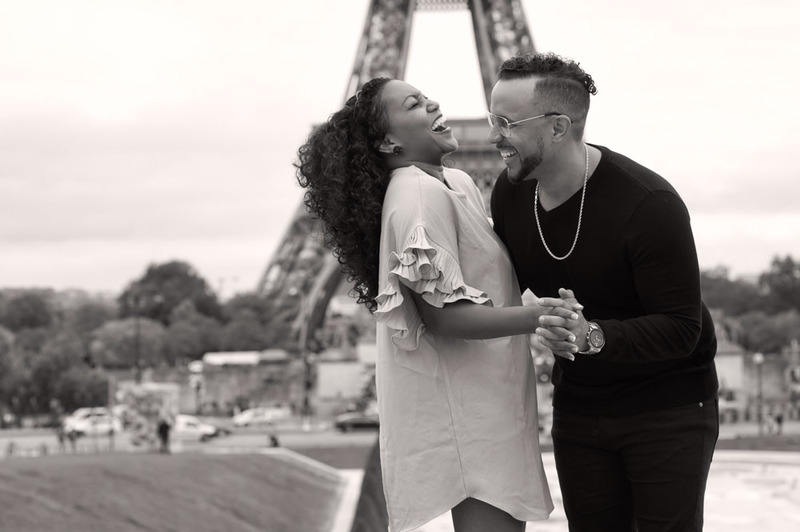 Those two look so happy together and we are so glad that they had a wonderful afternoon with us in Paris. 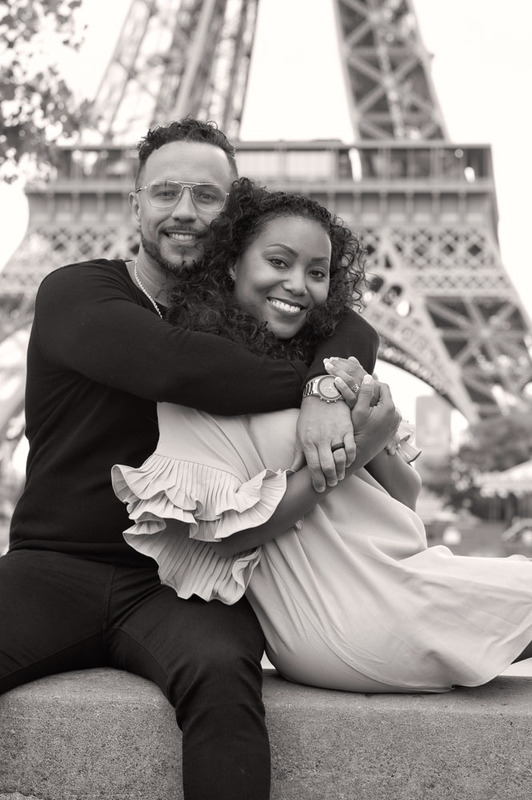 The photos of their engagement are gorgeous. They are full of life and all natural. 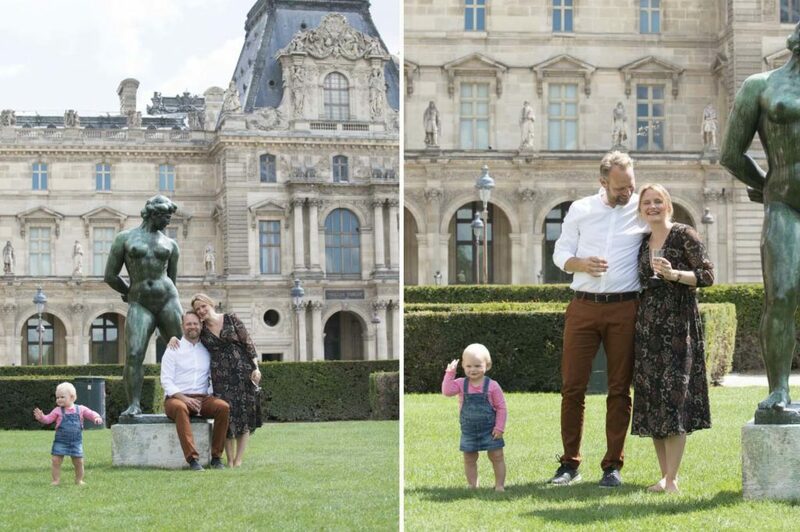 They simply look very happy and had a great time in front of Olivier’s camera thanks to his goofiness and wonderful sense of humour. Olivier knows exactly how to make people relax and have fun. It is such a pleasure looking at this serie this morning. 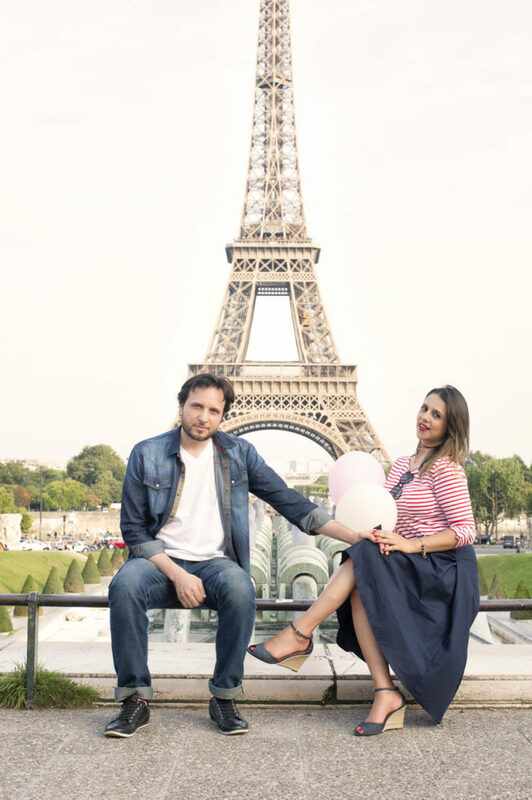 Andreia and Julian enjoyed our “Léon Picnic” late afternoon on the grass of the trocadero. 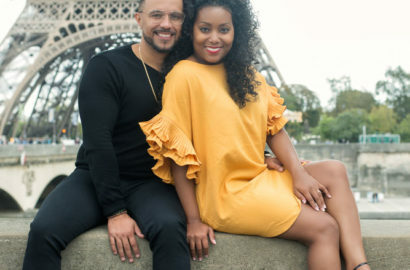 Olivier took them around the Trocadero for a mini photo session once the picnic was over. 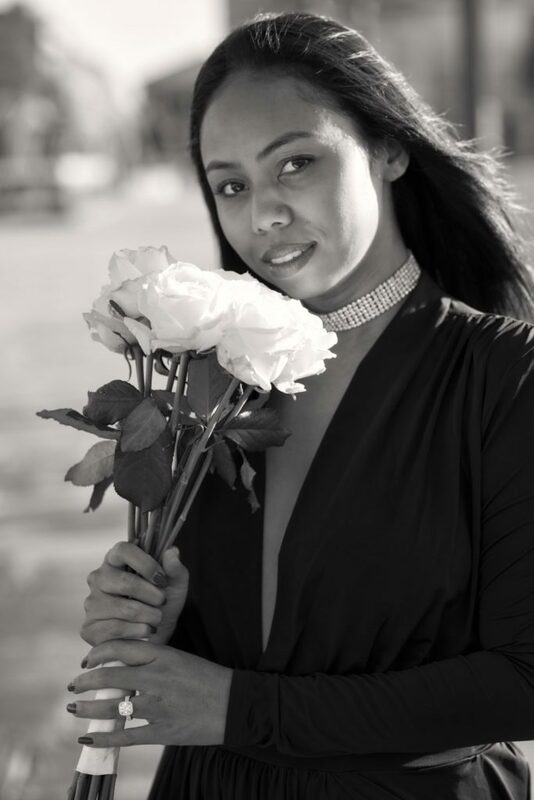 Our mini photo session lasts half an hour and includes 15 beautifully retouched photographs in high definition ready to print and frame on your wall. Olivier somehow finished quite late last night! I heard they had such a good time that he got carried away with chatting and photography! 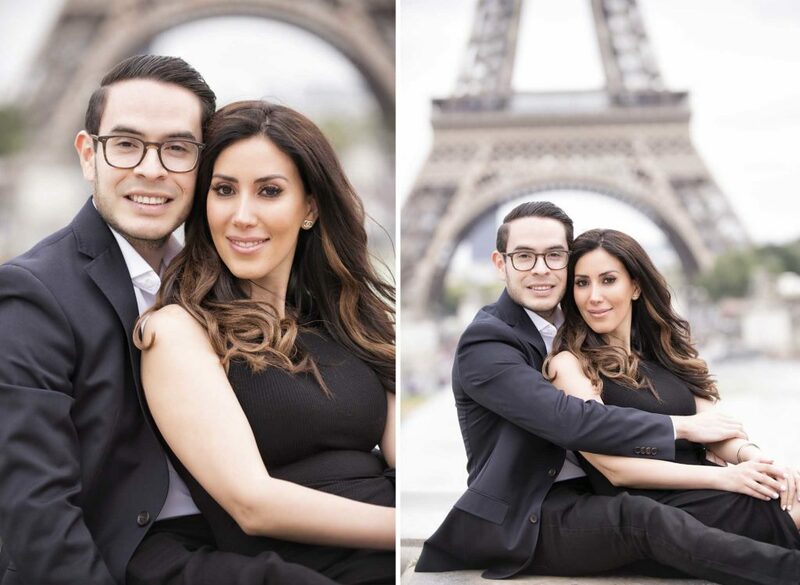 As a result, they are so many gorgeous portraits of our Brazilian couple with the Eiffel tower in the background. I am terrible at editing photographs myself and wouldn’t know how to choose. They all look stunning really. 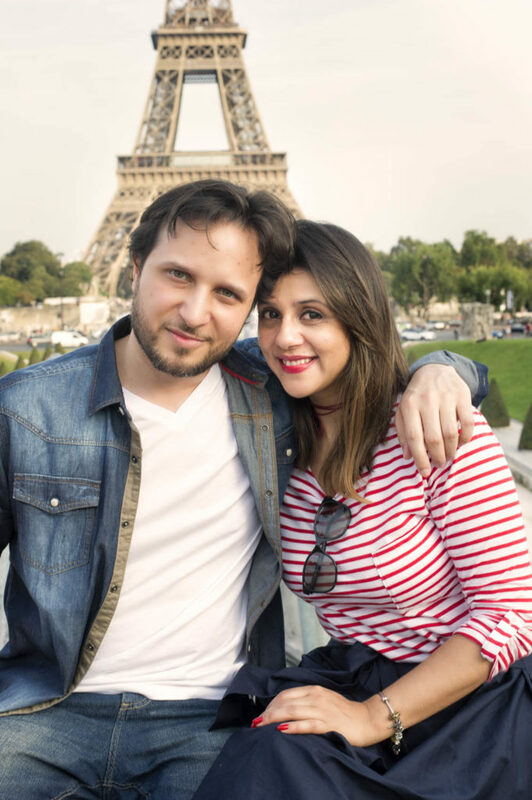 I am so glad we were part of our couple happiness in Paris with our gourmet picnic and the photographs taken by Olivier that I am sure they will cherish for a very long time. What’s more exciting then a romantic picnic overlooking the Eiffel tower with your lover in Paris! The days are just beautiful in Paris at the moment. The city is quite peaceful. 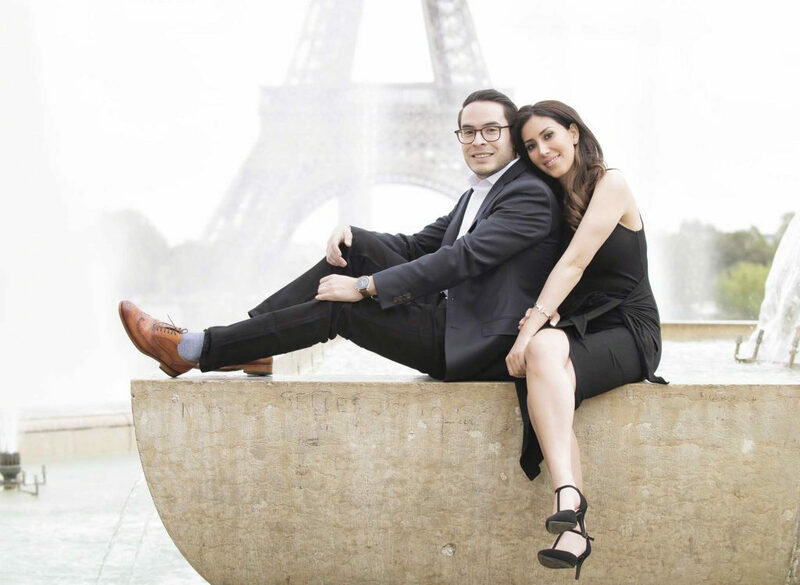 Most Parisians are still vacationing in the south. 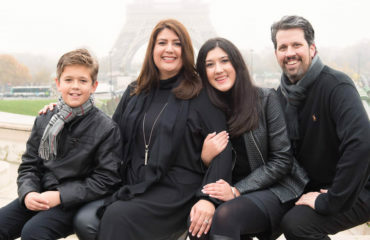 It is certainly one of my favorite time of the year to be in Paris. What a wonderful summer we have had! 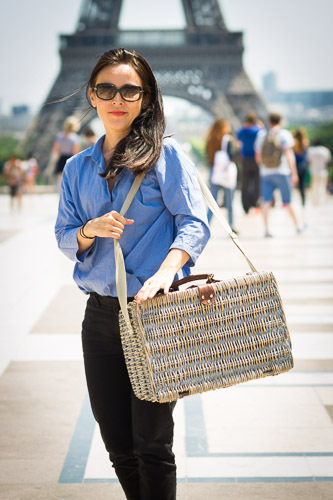 Monica had contacted us to order a surprise wicker basket gourmet picnic to celebrate her first trip in France. 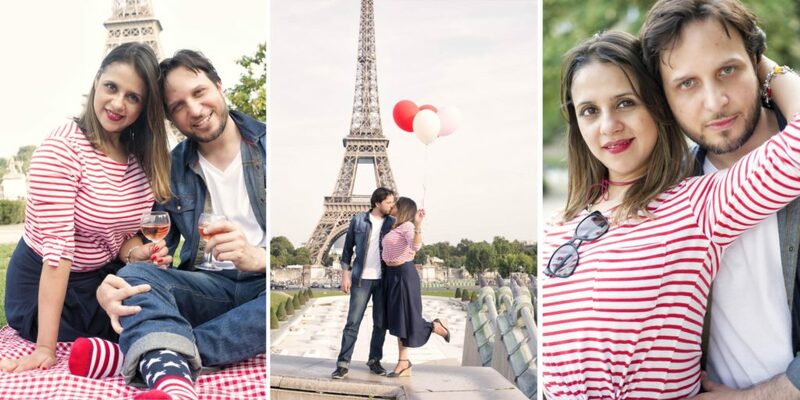 We set up our “Leon Picnic” & a one hour romantic photo session around the Trocadero for them as well ( They originally planned on a mini photo shoot which turned out to be too much fun and too short for their liking! ) . We actually showed some of the photos to some French friends we met up with last night. 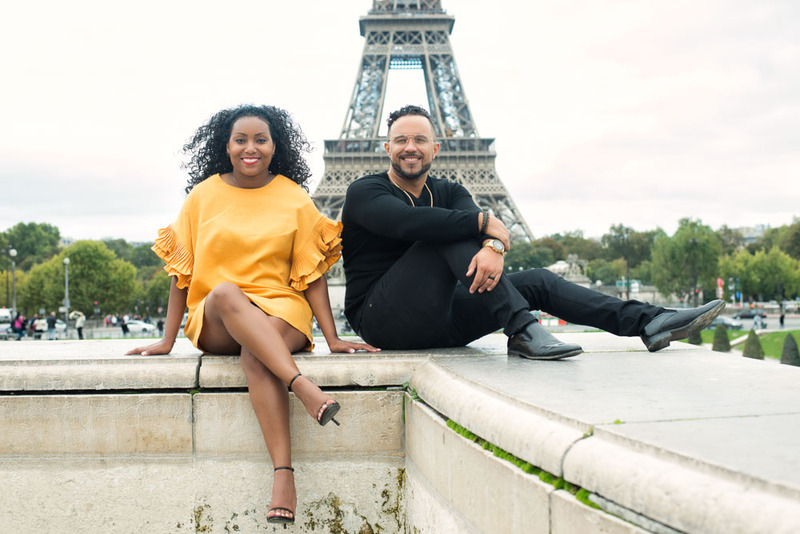 They thought the whole idea was simply brillant and decided to book “Love Picnic Paris” for an extravagant end of summer picnic at Versailles! And of course we couldn’t refuse such a fun outing. 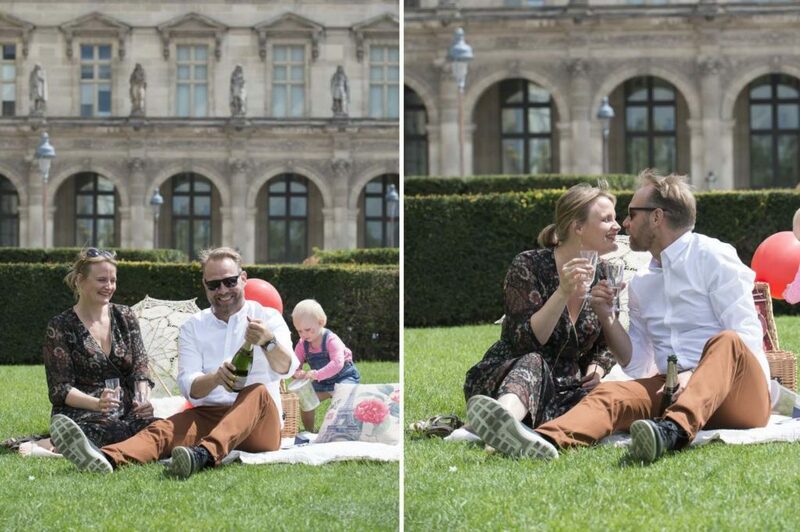 We are now considering proposing engagement & secret proposal & our gourmet picnics at the gardens of Versailles. It is very nice to get such wonderful feed back from everyone we meet. 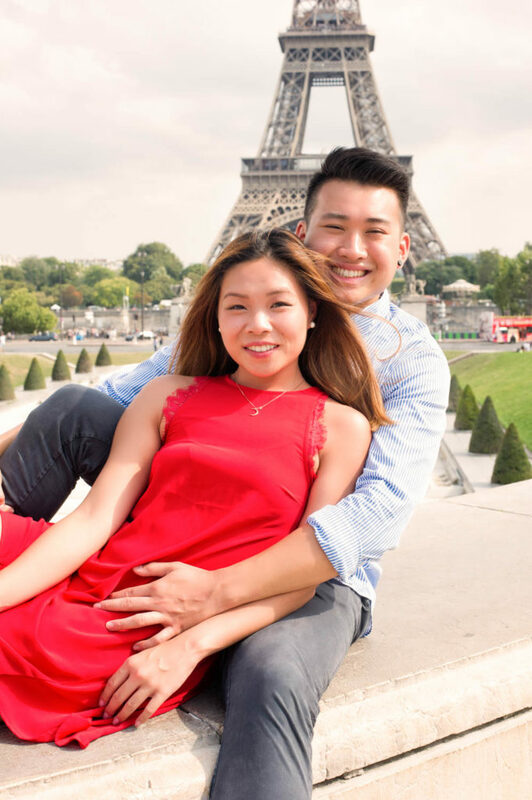 It is a wonderful feeling to create happiness in People’s life with some simple pleasure such as a Traditional wicker picnic basket delivered at the Eiffel tower. 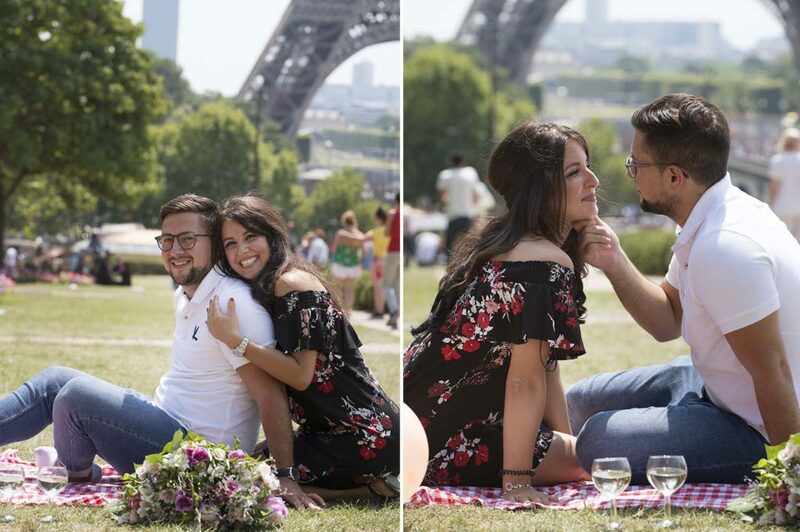 What’s more exciting then relaxing on the grass overlooking the Eiffel tower with your loved one, enjoying a traditional French Picnic served with a nice bottle of Bordeaux then walking around with a fun & professional and creative photographer taking some romantic photographs with the Eiffel tower in the background. What a treat really, only in Paris! A couple of important things to remember: We need you to place your picnic order a minimum of 24 hours prior to your big day. Our gourmet picnics take time to prepare & we cannot satisfy the last minute orders. 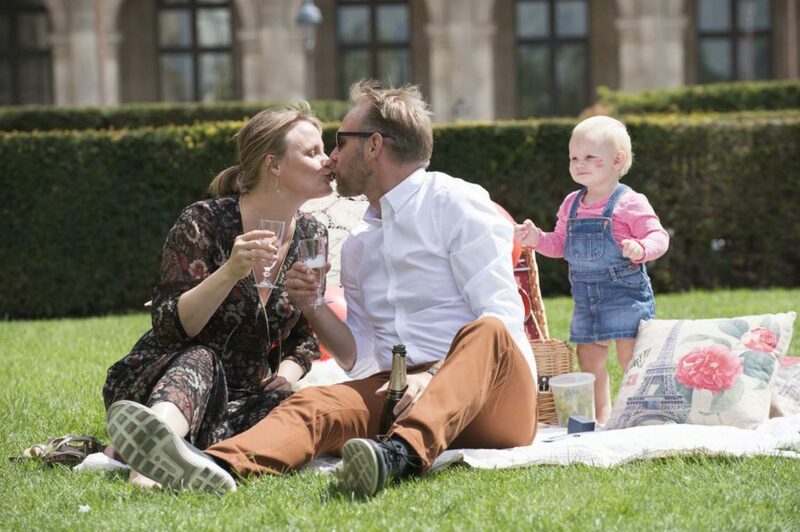 We only do one picnic at Lunch time and one in the evening and dates get booked very quickly so again reserve your date in advance so that you wont be disappointed. 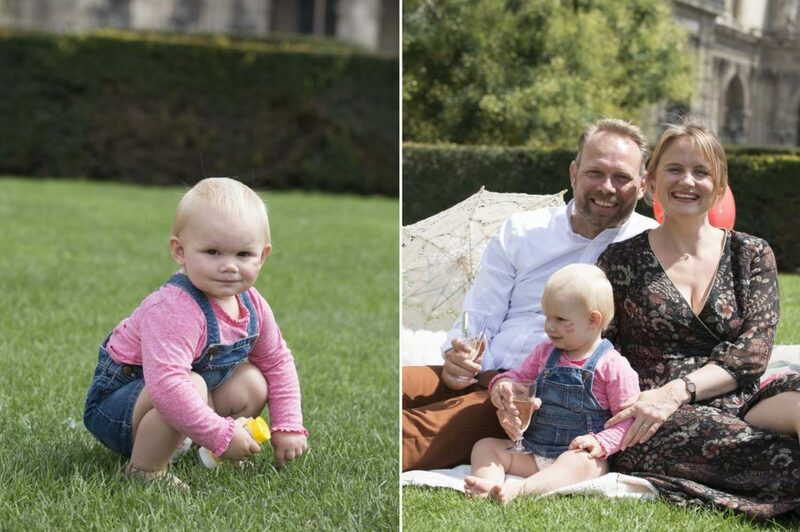 And last, although we do offer mini photo session, our photographer Olivier suggests that you invest in one hour photo session if possible. Half hour of photography flies, it is a lot of fun to do & it is really worth the investment to stretch it to a whole hour if you can afford it of course! You can view some of Olivier’s professional photographic work on his website by the way. We had the pleasure to prepare and set up our Edith Piaf picnic at the gardens of the Trocadero for a lovely couple from Los Angeles. 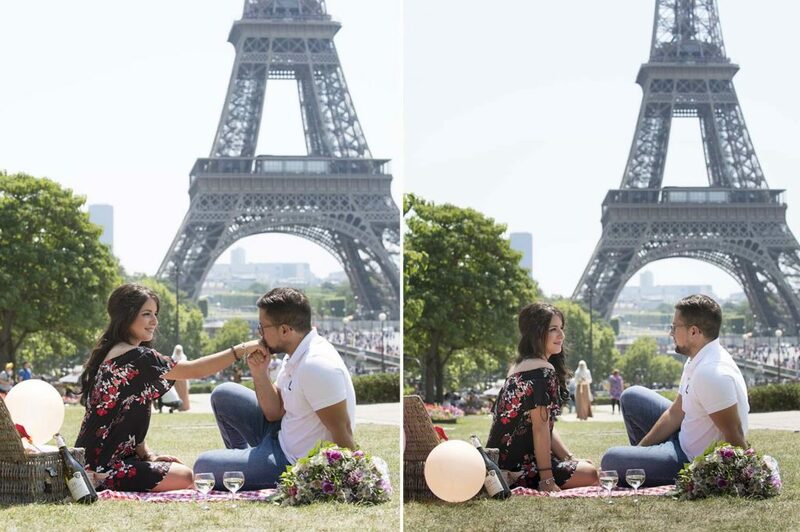 Ali proposed to his girlfriend very early morning at the Trocadero overlooking the Eiffel tower. 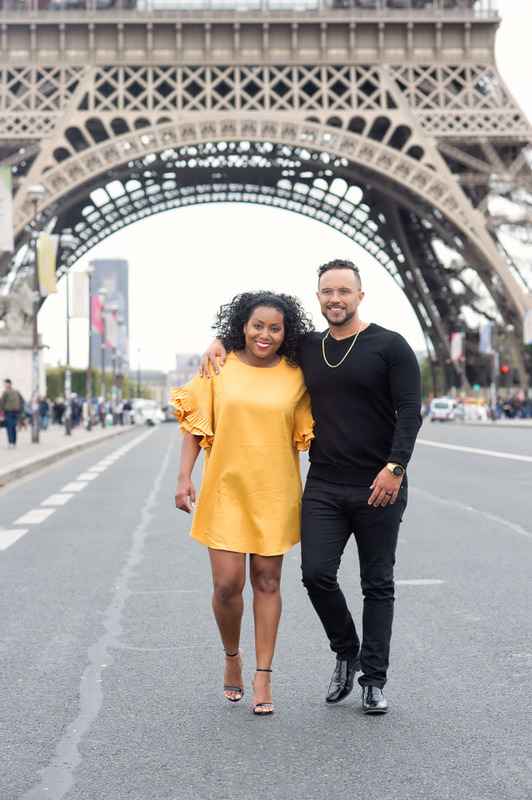 Olivier captured their secret proposal and by 7am they were finally officially engaged! 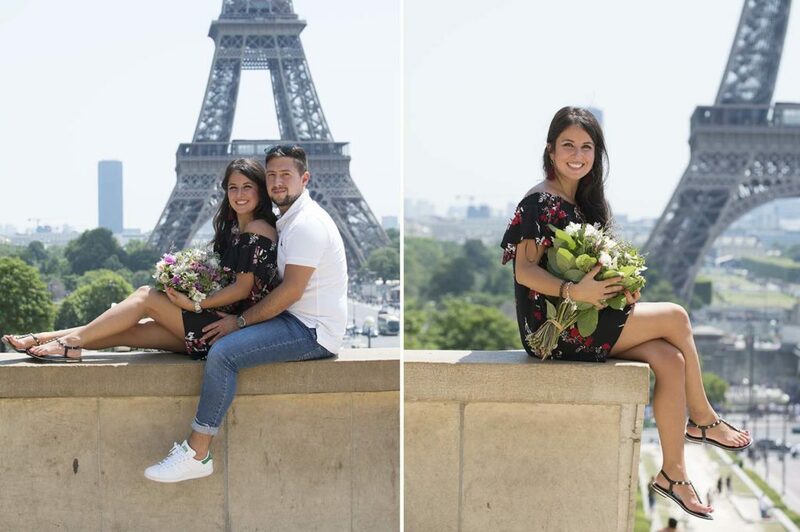 The three of them went around the city for a couple of hours so that Olivier could take their engagement photos with beautiful Paris in the background. 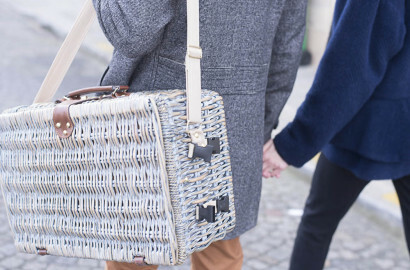 They then drove back to their hotel to refresh and headed out again to the gardens of the Trocadero where their wicker picnic basket with a lot of goodies inside was waiting for them. 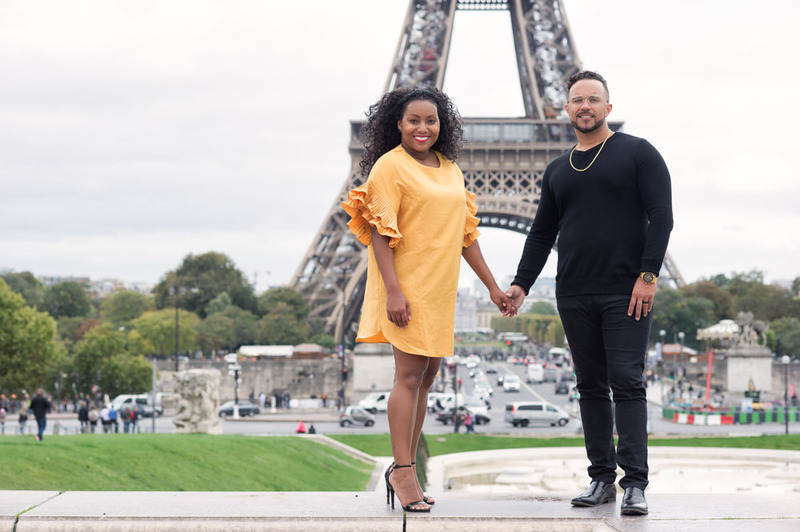 They had champagne to start their lunch with foie gras, smoked salmon and French cottage cheese, Roast chicked & Ratatouille and mash potatoes, macarons and gourmet chocolate for desert! Olivier dropped by again to photograph their picnic adventure. You will see a few photographs of their picnic at the end of this post. 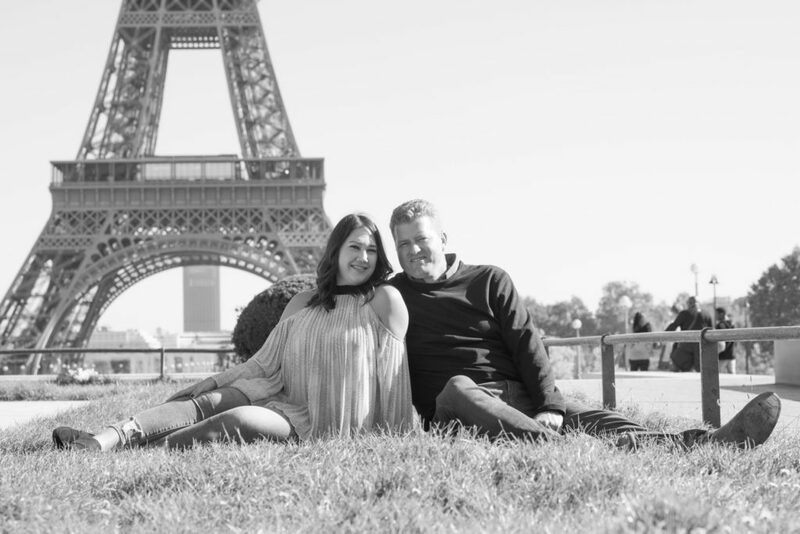 Lovely day in Paris, beautiful weather, we are getting ready for a few more picnics this week. We will be meeting new people and making new friends. 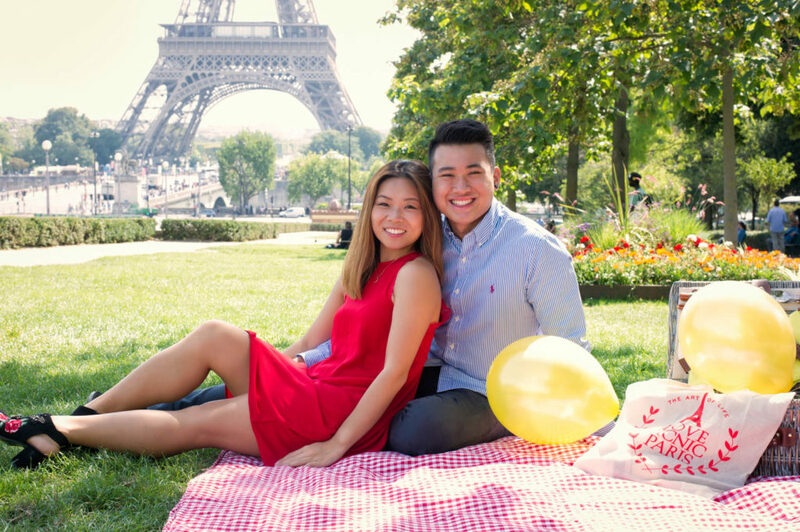 Hope to see you as well over one of our delightful picnic at the Eiffel tower! 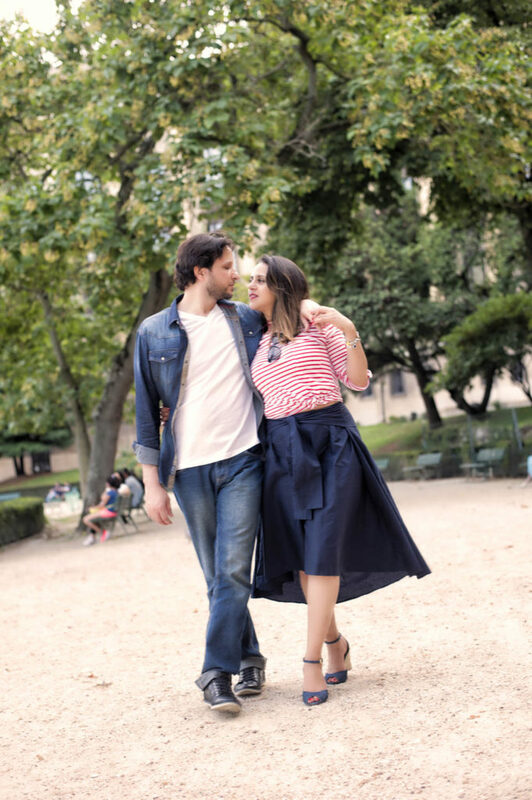 A romantic picnic in Paris + a photo session. 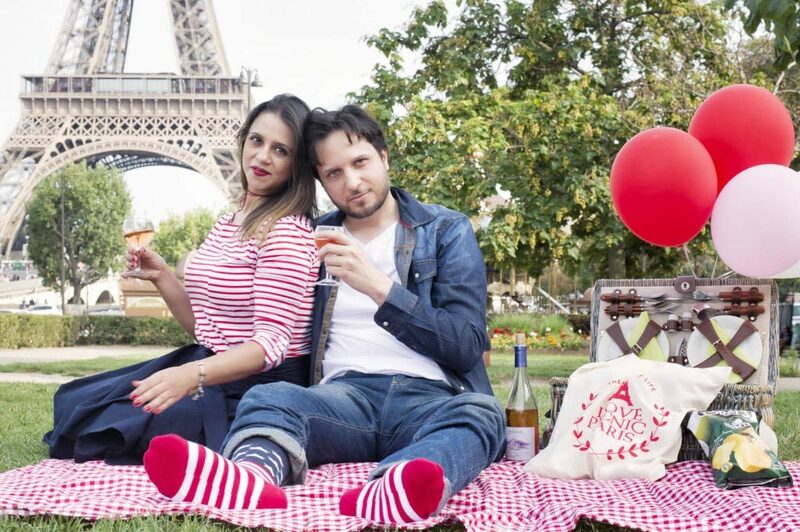 A romantic picnic with Anna and Igor in Paris. 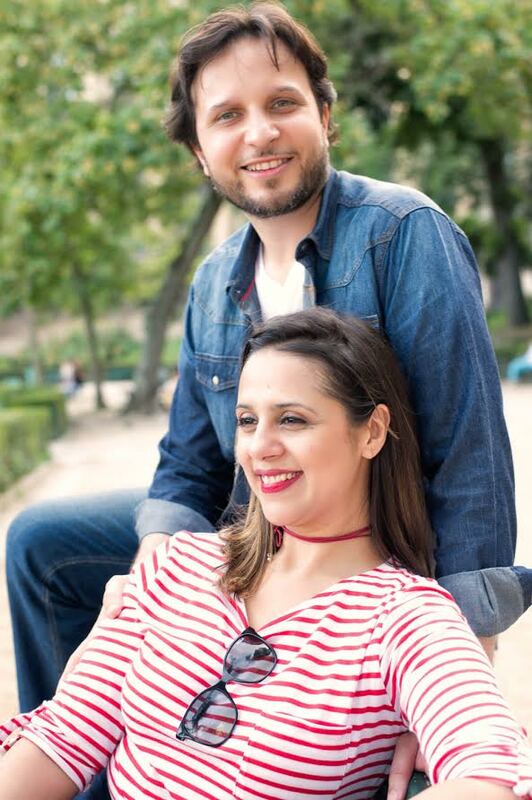 Anna came to Paris for a modeling job with her partner Igor who tagged along and met her for a few days. 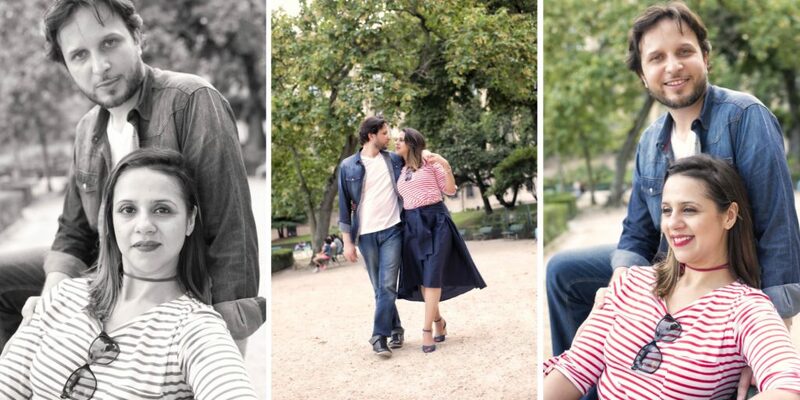 They had the beautiful idea of a romantic picnic in the city and a couple photo session with Olivier. 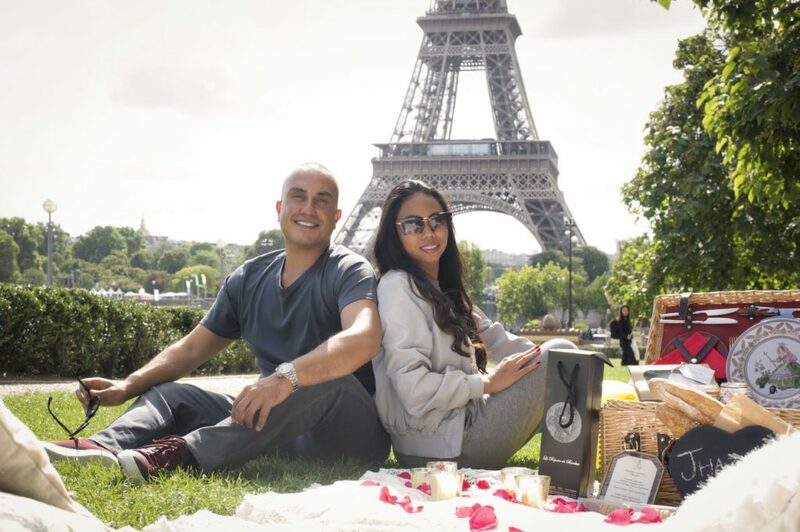 The “Ile Saint-Louis” was the perfect setting for our lovers picnic. 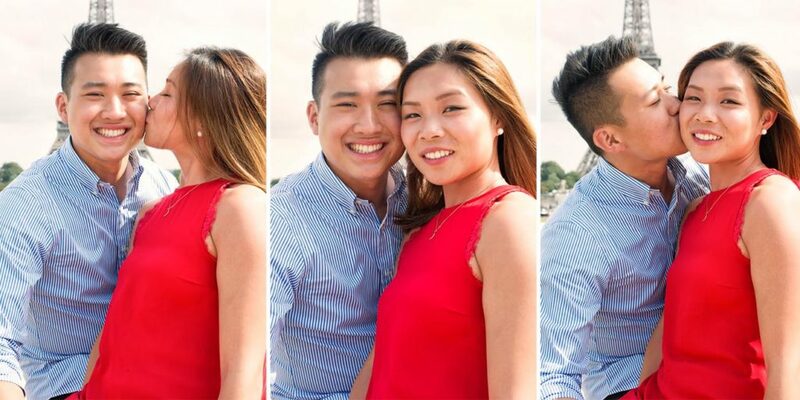 They had a wonderful time walking around the neighbourhood snapping a few fun, lovers photographs with beautiful Paris in the backdrop. 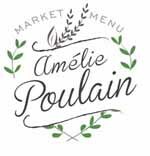 We prepared our “Amelie Poulain” picnic for them with some cold meat, a classic traditionnal home made French quiche with leaks from the market, cheese, string beans & avocado salad and fresh strawberries for desert. 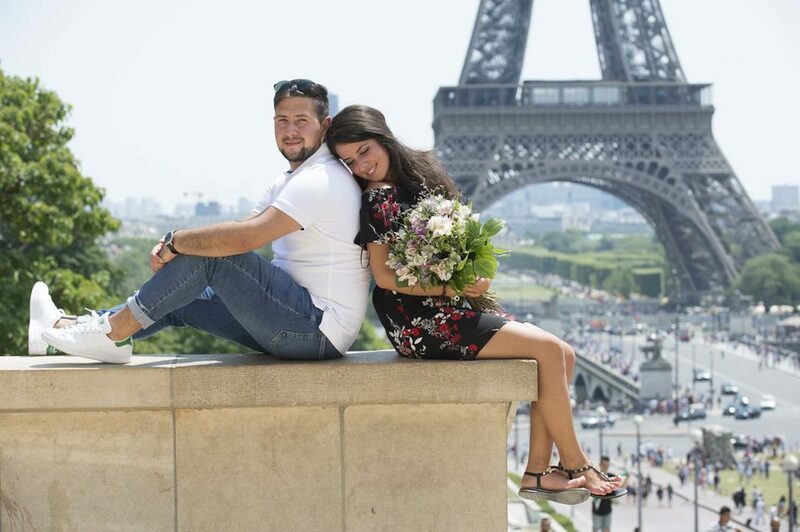 Igor offered to his beautiful girlfriend a little market bouquet of freesia. Picnic & love and some photos to celebrate the occasion and bring back home some souvenirs to share with friends and family. Perfect afternoon & they were so loving and and a perfect match, full of life and happiness.